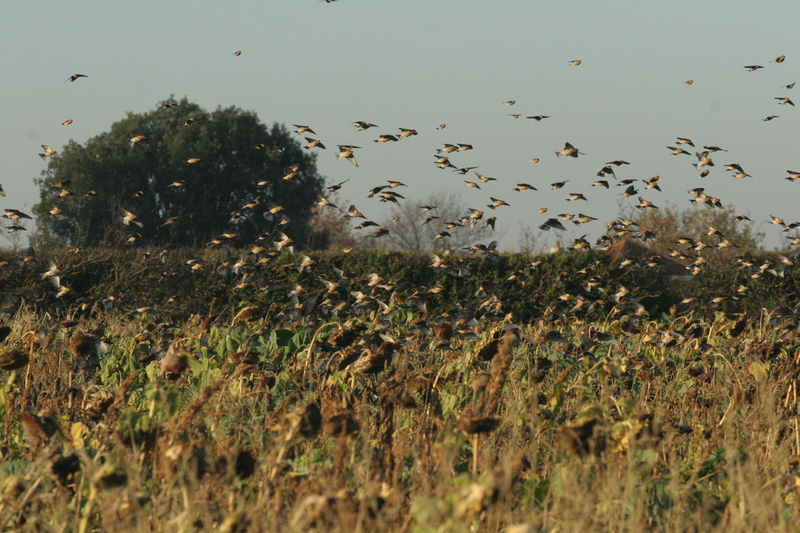 The Winter Bird Crops are going from strength to strength looking at the way the birds are rushing to get to them. 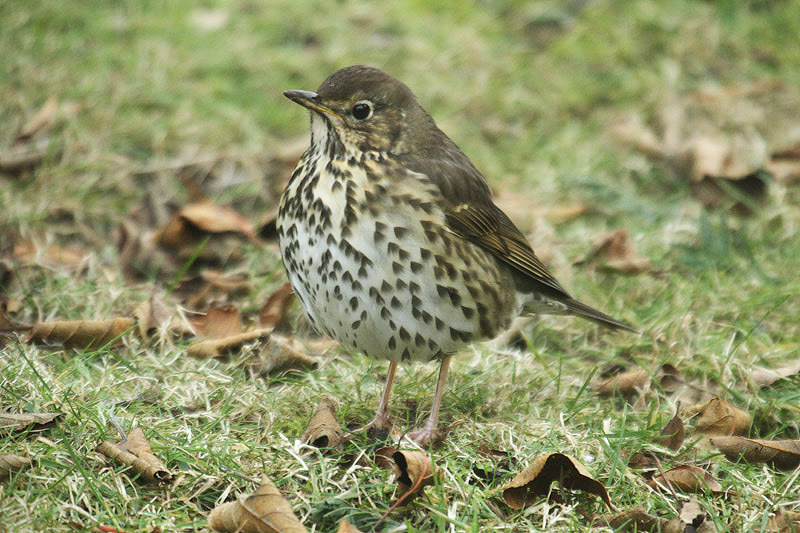 Results from last winter’s surveys at the crops show an increase in bird numbers of almost 40% in density (birds per hectare), even when the number of fields and area planted did not increase from the previous year. Most encouragingly, the vast majority of birds feeding at the crops were the targeted species: farmland birds such as chaffinch, linnet, reed bunting, meadow pipit, goldfinch and starling. 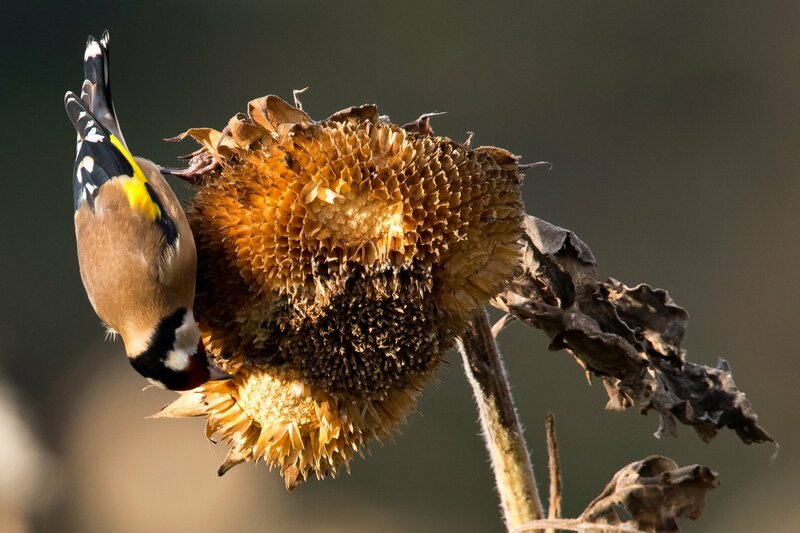 The winter bird crops are crucial to keep hundreds of birds fed and alive throughout the winter, when there is not much food to be found in the fields or hedges. 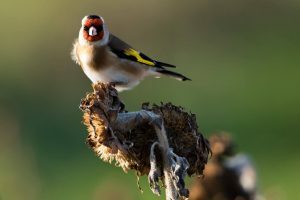 Many of the species benefiting from them are threatened right across their British and European ranges, and include local birds and migrants who come to spend winter here. Our research proves just invaluable the crops are for these vulnerable species and we believe that continuing this scheme is paramount for their survival. As we begin to plan for next year’s crops with the farmers, Action For Wildlife has stepped up once again and donated £1000 towards the seed for next year’s crops. This will be added to a private donation of £200 we received in the autumn, as we close in our target of £3,500. The intertidal habitat map has been compared with aerial photographs taken in 1944, 1980, 2003 and 2005. This suggests that the intertidal area at Les Minquiers is in good condition and there has been little measurable change in the type, size and location of its habitats. With the exception of some sand movement, the reef’s intertidal ecology seems to have remained stable during the past 70 years. Unfortunately, not measurable from historical aerial photography is small scale ecological damage that can result from activities such as low water fishing and boating, such as not returning boulders. In 1956 it was reported that ormer fishermen were not returning rocks and that this was killing off under-boulder fauna to such an extent that it was affecting shellfish stocks on the reef. Survey work at Les Minquiers since 2013 suggests that while some ormer fishermen still do not return rocks, this is not happening enough to cause widespread habitat and species destruction. 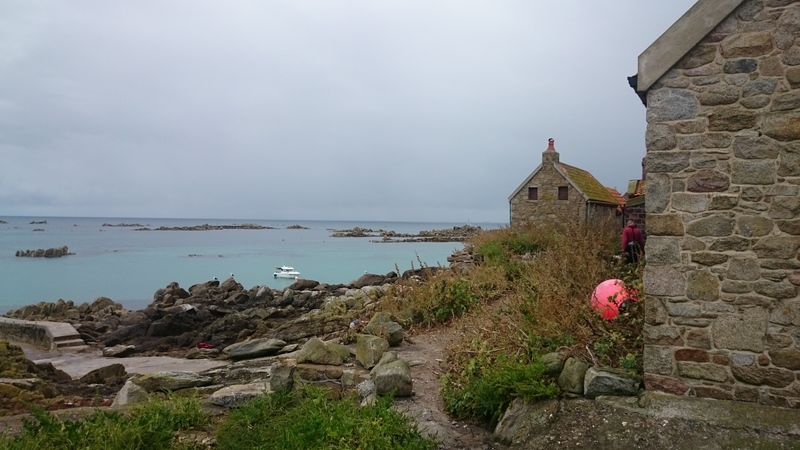 Low water fishing activities should periodically be quantified to avoid some of the problems that have occurred on the nearby Chausey Islands. 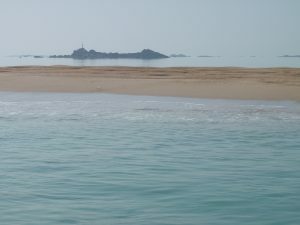 Compared with the French coast, pursuits such as raking, digging and ormering are at a low level on Les Minquiers and much that does occur tends to be within the anchorage at Maîtresse Île or on adjacent sandbanks. Raking has the potential to disrupt or destroy stable infaunal communities and is especially problematic in areas of eelgrass but when conducted on a small scale, habitats can recover and be repopulated from nearby areas. Promoting good practice regarding low water fishing will assist with the conservation of key intertidal habitats. Other potential but currently minor problems include the placing of moorings in eelgrass areas, the dumping of fishing gear and the threat from oil or other chemical spillages. Assessing the nature and quality of subtidal habitats at Les Minquiers has been problematic and there is much work left to do in this area. Diving, aerial photography and fisheries data all suggest that the seabed from chart datum to around five to ten metres in depth is probably in good condition with little obvious evidence of degradation. An exception to this is an eelgrass area to the south-west of Le Rocher du Sud which, in 2003, showed clear evidence of having been heavily dredged causing considerable damage. Deeper water areas have not been assessed since the 1970s but modern fisheries data indicate that the seabed to the east, south-east and north-east of the plateau has been regularly fished using mobile gear. The state of these seabed areas has not been ascertained but it is possible that they may have been damaged by commercial fishing and be in a degraded condition and/or affected by the accumulation of the American slipper limpet (Crepidula fornicata). Some form of seabed survey, possibly by remote camera, is desirable, especially in areas that the PhD study of Retière (1979) records as having had maerl. Non-mobile métiers, such as potting and line fishing, do less harm and, apart from instances of lost gear, are unlikely to cause long-lasting seabed damage. Rocky subtidal habitats are of less interest to dredgers and trawlers and evidence from divers, and the fisheries data, suggest that there has been little damage to rocky reefs or large areas of exposed bedrock on the seabed. Subtidal rocky habitats contain many delicate species such as sea fans, sponges and anemones and should be conserved whenever possible. A general lack of data pre-1992 makes it difficult to discern any population trends for marine species found at Les Minquiers. There is sufficient anecdotal information to suggest that a number of species have either disappeared from the reef or have noticeably declined. This includes the conger eel, sea bass, common octopus, slipper lobster, flat oyster and eelgrass, although their decline is probably related to factors outside of the reef such as regional overfishing, disease and climatic events. A severe decline in the ormer population is related to a combination of historical overfishing and, in 1999, disease. There has been some recovery since the 1990s but the population is at an historical low and further conservation measures may be needed to assure the ormer’s long-term regional future. The reef has also gained some new species, some of which have migrated up from southern Europe and there are seven invasive species that have arrived from neighbouring coasts. Invasive species can present a real threat to the local marine environment and some, such as wireweed (Sargassum muticum), have permanently changed habitats within Les Minquiers. Fortunately, the Plateau des Minquiers seems to have fewer invasive species than neighbouring coasts although it is possible that the American slipper limpet may be affecting deeper water sediment areas. It is only through international regulation and meaningful biosecurity measures that future arrivals can be minimised in the north-west European area. The table below summarises the number of species recorded from Les Minquiers from three separate periods of time: pre-1950; 1950 to 1999; post-1999. These periods broadly reflect elevated levels of recording that occurred either side of World War II and individual surveys during the 1950s, 1970s, 1990s and at the start of the current century. It is probable that the number of species recorded on Maîtresse Île is an accurate reflection of the island’s overall biodiversity and that there has been a loss of plant and breeding bird species since the end of World War II. The resident arthropods have probably remained stable and may even have increased with the renovation of the huts from the 1970s onwards. Microscopic animals, such as mites and diatoms, and lichens have only recently been studied. 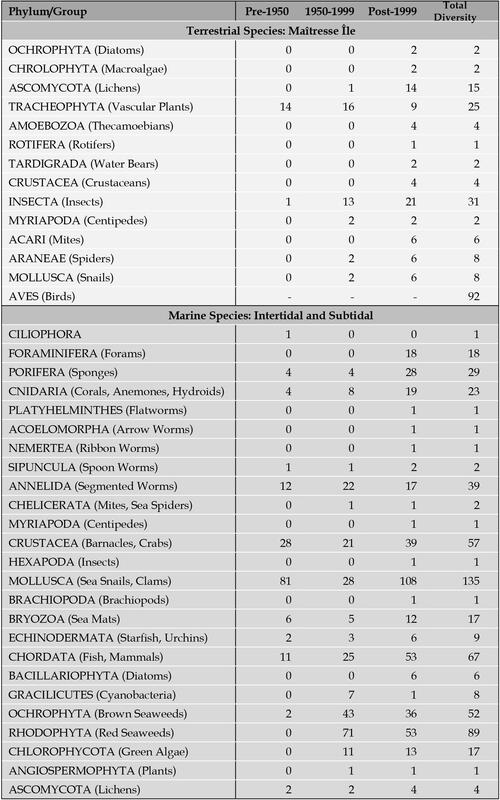 It is probable that the number of recorded marine species in the table is an underestimate with the total diversity probably being double or treble this total. Further targeted research will produce more records, especially in subtidal areas. Historical records are not good enough to discern whether there has been a decline in most marine species although this it is suspected in some cases. The information gathered during the course of this project suggests that Maîtresse Île is under considerable environmental pressure. Of particular concern is the issue of soil erosion which presents an immediate threat to the island’s wildlife and infrastructure. Addressing it is primarily a matter of awareness, stakeholder cooperation, management and infrastructure maintenance although there are some factors, such as rising sea levels, that cannot be tackled solely at a local level. In the marine realm the greatest threat is from the fishing industry and especially the use of mobile gear (such as dredges and trawls) on the seabed which can cause serious and irreparable damage to habitats and species. A review of ecosystem services suggests that Les Minquiers is an area of high biological productivity with habitats that make it an important nursery area for commercial fish and shellfish species. This has been suspected for some time and as early as the 1930s it was suggested that the reef was important to regional fish stocks. It is probable that conserving the nursery function of Les Minquiers will have a greater long-term economic return for the fishing industry than the short-term rewards gained from damaging its benthic habitats. It is, therefore, important that as much of the reef as possible is designated as a no mobile fishing gear zone but especially the shallow marine habitats on the Plateau des Minquiers most (but not all) of which are at present undamaged. Some other common solutions include the need for increased management, monitoring and awareness and there are a number of major potential threats (such as climate change, oil slicks and invasive species) that require international cooperation. However, in the short term it is local and regional management that offers the best and most immediate means of conserving the key ecological, infrastructural and cultural attributes of Les Minquiers. Historically Les Minquiers has been managed via an informal relationship between the States of Jersey, the Crown, hut owners and regional fishing authorities. However, in recent years other organisations and groups have been founded whose remit covers the reef including the Ramsar Management Authority, the National Park and the Maîtresse Île Residents’ Association. Exactly how the reef should best be managed and how this may best be accomplished without becoming intrusive or overbearing to its stakeholders, remains a matter for discussion. 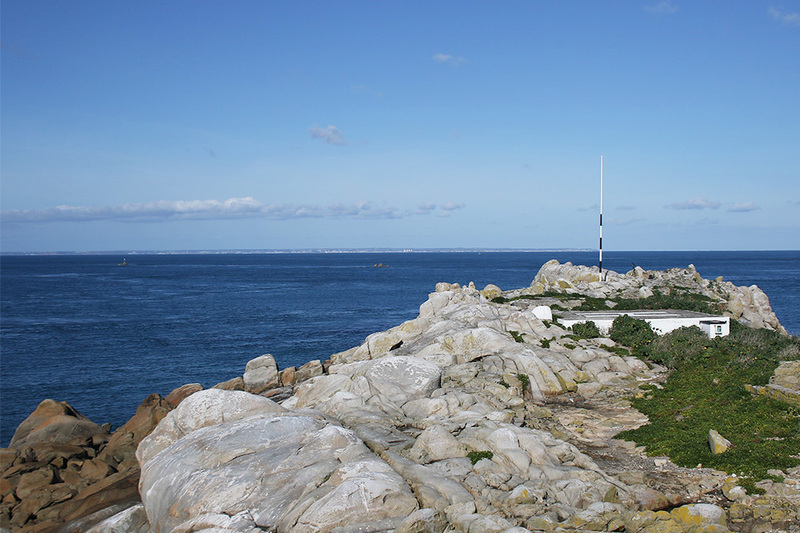 The project to study Les Minquiers was begun in 2012 by three members of the Société Jersiaise’s Marine Biology Section. They had been working on Les Écréhous and Paternosters and were aware of the importance and fragility of Jersey’s offshore reefs. They were aware that little was known about Les Minquiers and decided that they would take a look to see what could be done to rectify this. The initial plan was to just look at the reef’s marine biology (its most obvious natural asset) but it became quickly apparent that almost every aspect of Les Minquiers needed documenting. The team soon expanded to include botanists, ornithologists, entomologists, divers, geologists, archaeologists, meteorologists and all manner of other specialists. Every conceivable thing was studied, from single-celled organisms through to the reef’s complex political and cultural history. In the end the project had nineteen principal contributors plus over 50 others who assisted with fieldwork, data crunching, logistics and archive research. The projects results have been written up into a book which is available in a limited edition hardback (from Société Jersiaise only here) and a paperback. Any profit from the hardback edition will be used to pay for the project’s cost, most of which has been funded by the participants themselves. Why not take a break from the Christmas shopping this Sunday and join us to learn a new skill (or hone an existing one) and plant some trees! We will be getting together again with Conrad Evans and the team from Jersey Trees for Life to provide a Christmas present for Jersey’s wildlife! We will add to the organisation’s hedgerow campaign by planting native trees and shrubs around field boundaries to provide habitat corridors for the wildlife of St Peter. Meet at the Jersey Wanderers car park off La Rue des Sauvalleries, St Peter (south of Jersey Rugby Club). Parking is by kind permission of Jersey Wanderers. The task Planting trees and shrubs. Tools needed As always, we can supply some tools, but please bring your own if you have them. We are very limited on the number of spades we have available so bring yours along if you have one (please note that trowels, shovels, and garden forks are not suitable for this task). Clothing needed Bring gardening gloves (though we can supply a pair if you don’t have them), wellies or sturdy boots, (it could well be muddy and the vegetation may be wet it and it may be rough underfoot) and common sense clothes to cope with the elements, we go ahead whatever the weather! Work will be finished by 13.00. And, our very own Christmas angel Kim will supply hot drinks and her legendary homemade cakes at the end of the task. Following publication of the landmark book Les Minquiers – A Natural History Birds On The Edge asked one of the authors, Paul Chambers, to discuss the book and these remarkable but poorly known islands. Situated just 12 miles south of St Helier, the tangle of rocks, reefs and sandbanks that form Les Minquiers is a world entirely removed from the bustle and traffic of Jersey life. At 300 km2 the Minquiers’ plateau is larger than most British cities and yet at high tide only 0.002 km2 remains above the sea. Six hours later (and drop in sea level of up to 13 metres) and the area of exposed seashore expands by some 10,000 per cent to 20 km2. 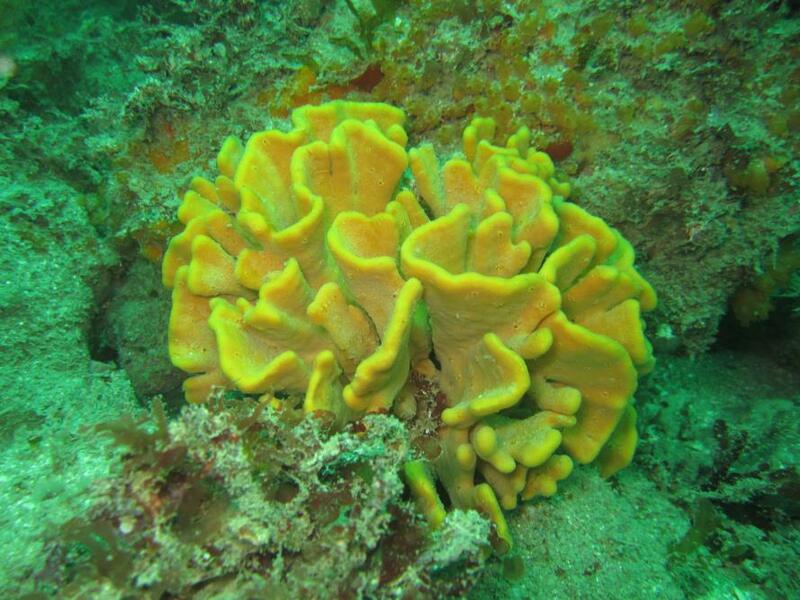 The reef holds around 20,000 individual rocks the oldest of which are at least 640 million years old. The one vegetated island, Maîtresse Île, has a rich prehistoric archaeology which suggests it has been regularly used by humans over the past 4,500 years. 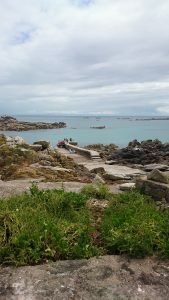 This wonder of the natural world is sat on Jersey’s doorstep and yet until recently very little was known about the history or natural history of Les Minquiers. ‘There is perhaps no area of comparable extent in the British Isles about which so little is known,’ wrote the celebrated geologist Dr Arthur Mourant in 1977. This remained true until 2012 when a small team from Jersey’s Société Jersiaise set out to document the reef’s marine and terrestrial biology. 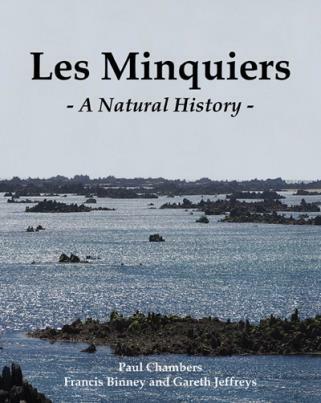 Following the recent publication of the team’s landmark book on the history and natural history of Les Minquiers (see book here) we are pleased to present an overview of the current ecological health of Les Minquiers. This has been adapted from the ‘Summary and Conclusions’ chapter in the book. In 1998 the Jersey in the New Millennium government consultation document stated that Les Écréhous and Les Minquiers ‘may very well warrant SSI [Site of Special Interest] designation and even international recognition but there is an urgent need to recognise their unique character and the ecology/landscape/leisure use linkages in a “national park” style designation akin to that given to Les Mielles. The increase in leisure boating activity and the number of marinas on the adjacent French coast will subject these reefs to increasing people pressure with obvious knock-on ecological impacts’. 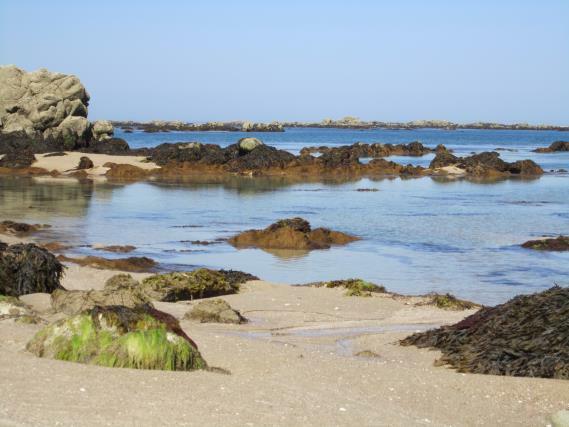 Since this was written all of Jersey’s offshore reefs have been designated as Ramsar (Wetlands of International Importance) areas and the terrestrial areas included within the Jersey National Park. Maîtresse Île is scheduled to become a Site of Special Interest (SSI) and has been subject to various management plans, laws, policies and multilateral environmental agreements. This has drawn attention to the importance of the offshore reefs and yet, until recently, there remained a general lack of appreciation of their histories and natural histories, and an absence of coordinated study, management and monitoring. 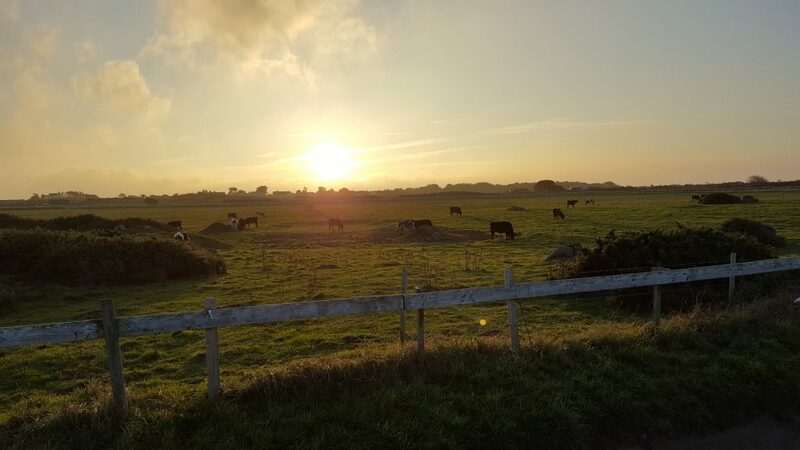 It was this knowledge gap that inspired a small team of amateur and professional naturalists to spend four years studying all aspects of Les Minquiers, from its history, archaeology and geology to its animal and plant life. Their results are published in the book, already described as ‘an achievement on a global scale’ by The Sunday Times environment correspondent (and author of End of the Line) Charles Clover. Aside from providing a comprehensive overview of every aspect of Les Minquiers, the project’s results provide much of the basic information that is needed by local, national and perhaps international authorities to make decisions regarding the reef’s present-day management, as well as to develop strategies to safeguard its future. Presented below is a summary of those results and conclusions that most concern the general environmental and ecological health of Les Minquiers, especially those which might have some relevance to the reef’s future management. These should not be taken as an exhaustive summary of all the project’s results as much other information is provided in the book and a reading of the relevant chapters is recommended. Regardless of how the information derived from this project is used in the future, the authors would like to think that their work does fulfil the ‘urgent need to recognise the unique character’ of Les Minquiers, as requested by the States of Jersey in 1998. Presented below is a summary of key facts and conclusions relating to the current and historical environmental status of Les Minquiers. This includes aspects of the reef’s archaeology and oceanography but does not include summaries of information relating to the human and geological history of the reef unless it touches on ecological and environmental matters. The general topography of Les Minquiers has probably changed little since the post-glacial sea level stabilised around 2,000 to 4,000 years ago. Much of the plateau is made of hard igneous rock about ten per cent of which is exposed at low water. There has been little opportunity for human activity to destroy or alter the bedrock and so many parts of the reef will present the same profile now as they did when the first Bronze Age hunters travelled to the reef in search of seals. The main exception to this is Maîtresse Île and several nearby rocks whose physical profile has changed considerably following quarrying in the early nineteenth century. The removal of rock from the north-west and south-east of the island may have accelerated soil erosion by allowing breaking waves to access the area west of the huts. It is probable that some soil erosion had occurred prior to this but quarrying may have accelerated the process. A second noticeable change in topography concerns the reef’s many sandbanks which build up against rocks or form in the lee of obstacles within tidal currents. An obvious example is the large sandbank known as Le Gris Banc which, since the time of the first hydrographic surveys, has moved steadily eastwards into an adjacent channel. This movement accelerated in the 1990s entirely closing what was once a navigable gap of around 300 metres. Other less strategic sandbanks, such as Le Banc du Turbot, may also have changed shape in recent decades. 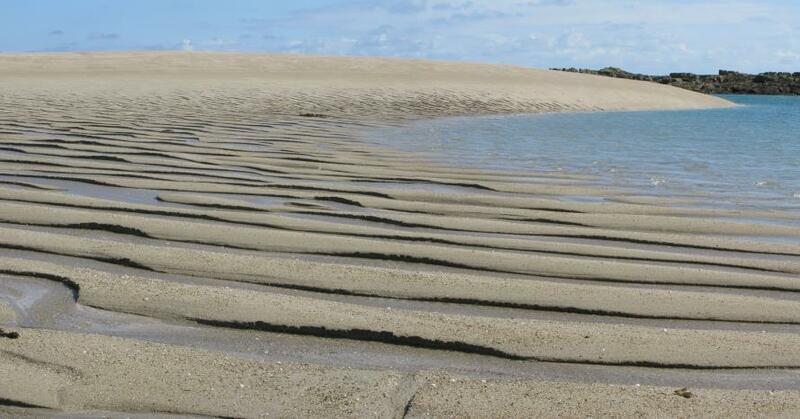 Although visually remarkable and a nuisance to boaters and chart makers, sandbank movement is probably part of a natural cycle of accumulation and erosion within the reef. The small terrestrial area of Maîtresse Île has probably seen the greatest change of any place on Les Minquiers. Prior to the nineteenth century Maîtresse Île was a remote, largely untouched, vegetated island with no freshwater which was irregularly visited by fishermen. 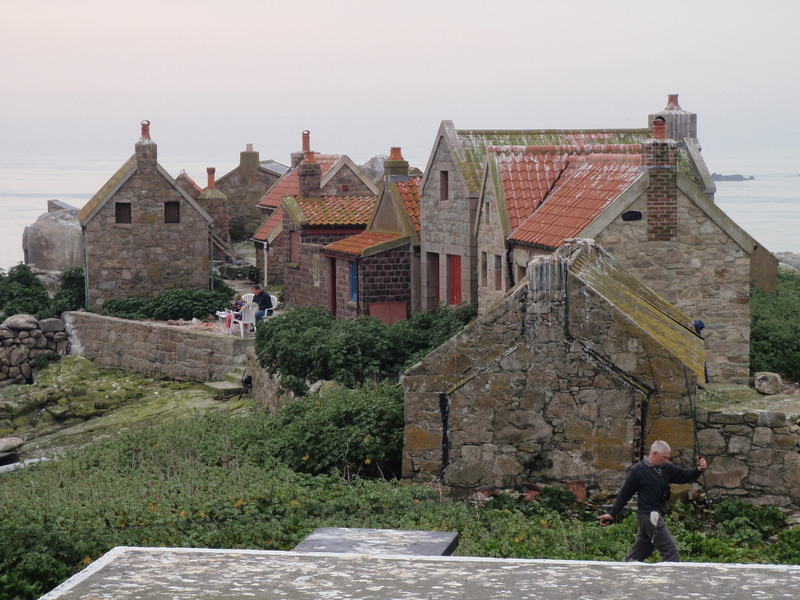 Then came the quarrymen and more organised fishing from La Rocque Harbour so that by the mid-nineteenth century around 18 stone buildings had been built which were permanently inhabited during the spring and summer months. 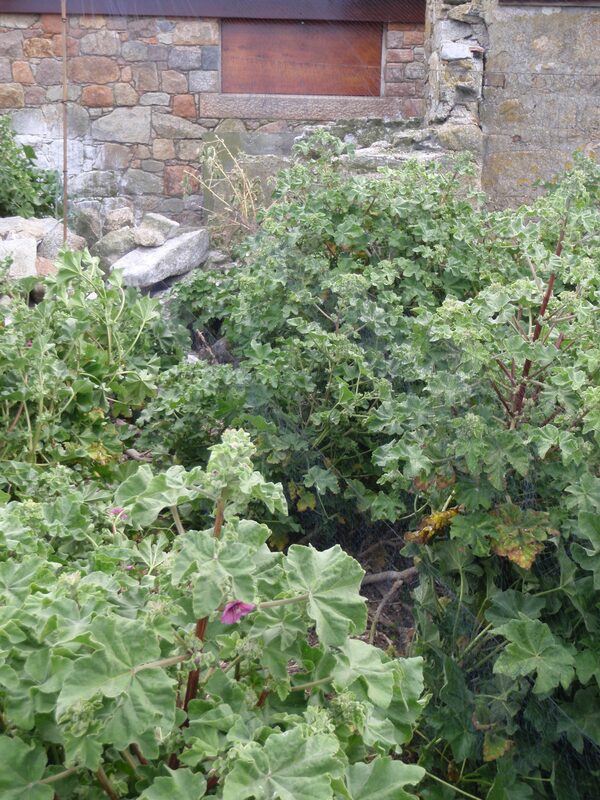 It is probable that the fishermen managed the island’s vegetation (especially tree mallow) creating habitats for specialist coastal plants such as grasses. Throughout this time soil erosion continued to operate on the western and north-eastern edges of the island. Following World War II the huts were abandoned, allowing plants and birds to take over. Renovation of the derelict buildings began in the 1970s and, by the 1980s, had led to a new phase of development and occupation by Jersey families. In 2016 just two hut sites remain undeveloped. As huts have been renovated and visitor numbers have increased, so the biology and ecology of Maîtresse Île has gradually changed. This was accelerated by the application of weed killer across the island in 1973 which removed an estimated 99% of all plant life. Erosion was enhanced immediately following this event leading to considerable soil loss. Over the past century a total of 26 plant species have at some point been recorded from Maîtresse Île. The most species observed during an individual survey was 16 in 1973, immediately after the weed killer incident when, ironically, opportunistic weeds temporarily appeared. Currently there are eight known species with those plants that have disappeared during the past century mostly being grasses and short species such as thrift. Some of these (including thrift) may have been permanently removed by the weed killer incident while others were possibly crowded out by the tree mallow which currently dominates the island. It is possible that tree mallow is naturally pervasive on Maîtresse Île and that, left to its own devices, this is the species that will proliferate and dominate. Other historically recorded species, such as grasses and thrift, may have been present only as long as the fishermen were resident and regularly clearing the tree mallow. Aside from aesthetics, the most important roles of vegetation are to prevent soil erosion and provide food and shelter for wildlife. This is especially true for the island’s bird life with almost all the 92 recorded breeding and migratory species being dependent on the presence of tree mallow. The destruction of vegetation exposes soil to the effects of waves, wind and rain, causing it to erode rapidly. Since 1928 Maîtresse Île has lost an estimated 50 per cent of its soil cover and it is soil erosion, above all else, that presents the greatest environmental threat to the island’s ecology. Soil provides an anchor for vegetation which is in turn needed by birds and invertebrate animals. Soil also supports hut foundations and contains archaeological material. Although the issue of soil erosion has been raised several times by archaeologists, little has been done to address it. This should form a central part of any future management plans for Maîtresse Île, especially with regard to the way in which visitors and residents use the island. Without soil, Maîtresse Île will lose its wildlife, its infrastructure and its archaeology. Without soil, the central part of the island will be around a metre lower in height which will permit storm waves to sweep up from the south and east and cross the spine of the island. Only the high points around the flagpole, Le Gabé and to the west of the toilet will be significantly above the high water mark. In such circumstances the huts and any terrestrial species are unlikely to survive, leaving Maîtresse Île a largely barren rock that, like La Grande Maison, would support only nesting birds, maritime algae and some lichens. 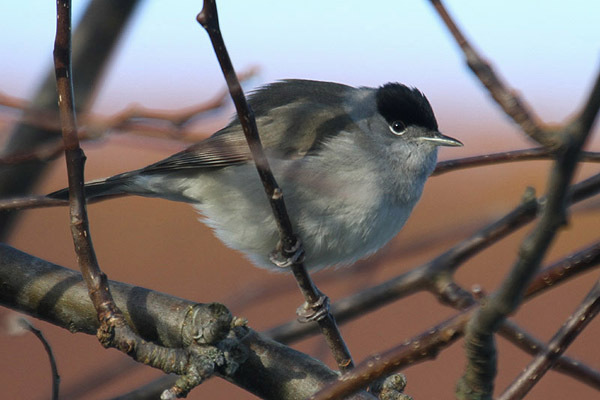 Another notable biological change to have occurred in recent decades is in the use of Maîtresse Île by nesting birds. The discovery of seabird bones from the Bronze Age suggests that the island has been used as a nesting place for thousands of years. It is unlikely that seabirds would have nested successfully when fishermen were in residence as the nests would probably have been raided or scattered. 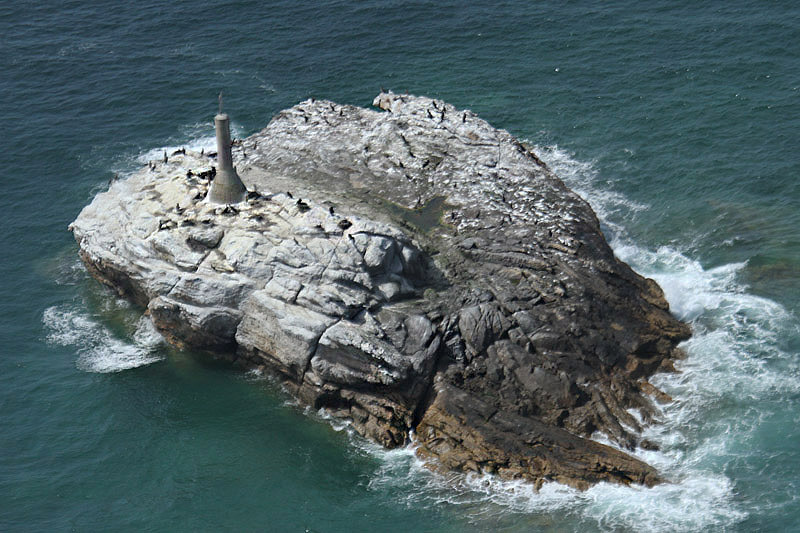 After World War II birds did nest successfully as the ruined huts provided shelter for shags, gulls and other seabirds. Since renovation of the huts began in the 1970s, there has been a decrease in the number of species nesting so that currently it is only gull species which nest in any number on the rocky areas to the west and north of the huts although, in July and August 2015, a large number of Terns nested on the north of the island for the first time in living memory. In recent years weather, inadvertent disturbance and deliberate damage to nests has led to some poor breeding seasons on Maîtresse Île. For example, in 2014 all the gulls’ nests were deliberately destroyed early in the season leading to a disastrous breeding year for the birds. Additional monitoring of when, where and which species are nesting on the island might allow for a more targeted management during the nesting season. A second nesting site exists around the base of the beacon at La Grande Maison which seems to receive little human interference. There have been many other events and incidents that have affected the ecology of Maîtresse Île in some way. Most of these result from individual acts of ignorance, such as clearing vegetation for camping or picnics, placing heavy machinery on the island and lighting barbecues on bare soil or next to huts. Other actions derive from ignorance or wanton destruction of property and the dumping of litter and chemicals are more deliberate acts. An increased awareness of the fragility of Maîtresse Île’s ecology amongst visitors and residents will go some way to resolving these problems. Signs, websites and literature (such as posters and leaflets at marinas) should promote a greater understanding of Maîtresse Île and its ecology. 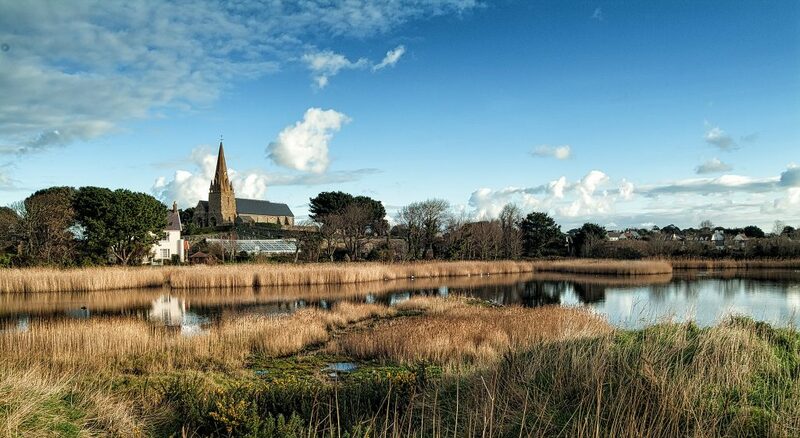 There have also been issues around repairs and renovations on the island and it is recommended that future projects (whether by Jersey’s authorities or individuals) are made to adhere to tight management plans which avoid the risk of soil erosion, habitat destruction and pollution. One final and probably unavoidable issue facing Maîtresse Île is that of climate change and rising sea levels. Many different models and claims are made about the cause and visible effects of climate change but evidence does suggest that the global climate is undergoing a warming phase and that the sea level is rising. For low-lying islands and reefs this is not good news, as even small sea level rises risk increased erosion and marine inundation. This may be compounded by a predicted increase in the number and severity of storm surges as the warmer seas create and empower low pressure systems. Between October 2013 and March 2014 the coast of Europe was hit by a series of spectacular storms that rolled in off the Atlantic swamping and damaging coastlines along the English Channel. On Maîtresse Île these storms removed soil from the west of the island, damaged two of the seawalls and undermined the concrete area at the top of the slipway. 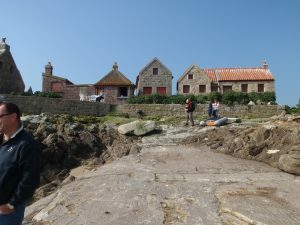 Similarly, a storm surge in February 2008 damaged a wall and shifted large boulders across the slipway. As the sea level rises, so the destructive potential of waves will move higher up the island placing pressure on the sea defences and further increase the action of soil erosion. This issue is being addressed for Jersey’s sea defences and needs to be addressed for Maîtresse Île too. The results from this project suggest that Maîtresse Île is facing several immediate threats, the most serious of which are issues relating to soil erosion, habitat/species loss and storm damage. These, and other threats, are best addressed through coherent management and monitoring of the island, investment in infrastructure maintenance, the cooperation of its principal users and raising awareness for visitors and potential visitors. The Department commissioned Amphibian and Reptile Conservation to analyse and prepare a report on 10 years of citizen science data collected under the Toadwatch survey. Jersey residents were asked to take part in Toadwatch by reporting sightings of our crapauds (spiny toads) using ponds. Data has now been collected for over 10 years (2005 – 2014) and this analysis has created an up to date toad distribution map for Jersey. 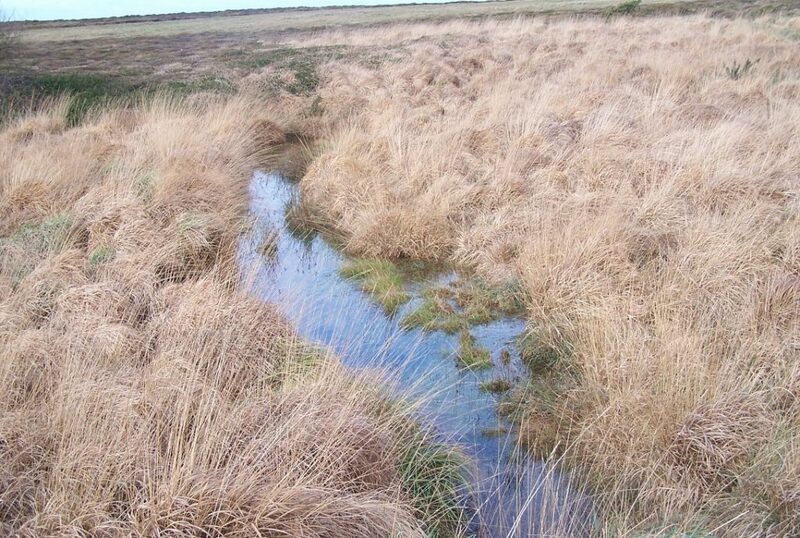 It has highlighted features of the Jersey landscape that are most important for toads and suggested areas to create new breeding ponds. A breakdown of the types of ponds used for toad breeding overwhelmingly supports the suggestion that man-made habitats are critical for the species’ survival in the island. Ensuring that these habitats are maintained and connected across the Island is considered to be a critical task to conserve our toads into the future. The main document Ten Years of Jersey Toadwatch: Analysis & Recommendations contains much technical information which will allow the modelling approaches described in the report to be repeated in future. 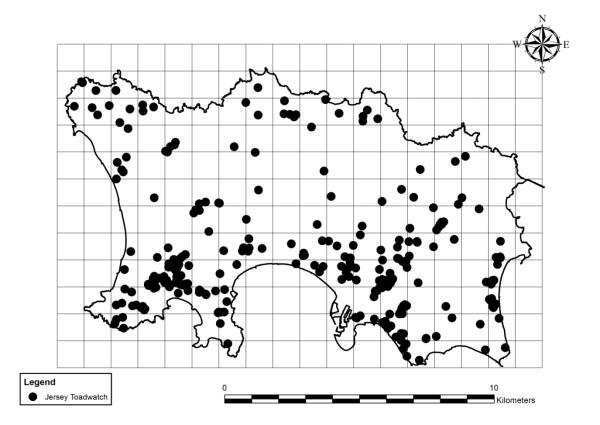 Records of Jersey toads were received from 281 locations between 2005 and 2014 and used to create a distribution map. The same data were used to create a GIS model indicating which features of the Jersey landscape are most important for toads. Ponds and gardens were most important, along with other man-made habitats like parks, golf courses and recreational fields, indicating the reliance of toads on anthropogenic features in the modern Jersey landscape. Between Noirmont, Woodbine Corner and Ouaisné (the latter population not currently recorded as part of Toadwatch) (to connect Noirmont with other populations and improve population robustness in this key area). Analyses of the Toadwatch monitoring data showed that timing of toad breeding was very variable (starting usually any time between early January and early March) but there was no discernible trend towards earlier breeding. Analysis of any population trends 2005-2014 is difficult due to inconsistencies by recorders; however, the average number of spawn strings per pond was <4, indicating generally small populations. The majority of ponds (81%) also had <30 toads in any one year. 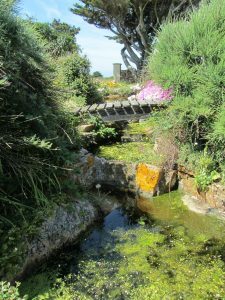 A breakdown of the types of ponds used for toad breeding in Jersey overwhelmingly supports the suggestion that man-made habitats are critical for the species’ survival in the Island. 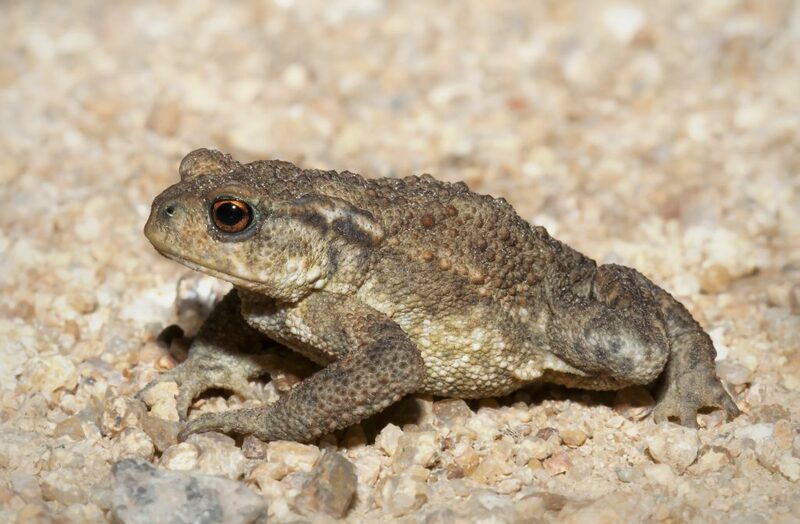 Nevertheless, almost half of the reporters recorded toads being killed on nearby roads – a consequence of their dependence on urban habitats. Toadwatch has not yet provided much data on other key species (such as grass snakes), though some islanders have begun to record these species. 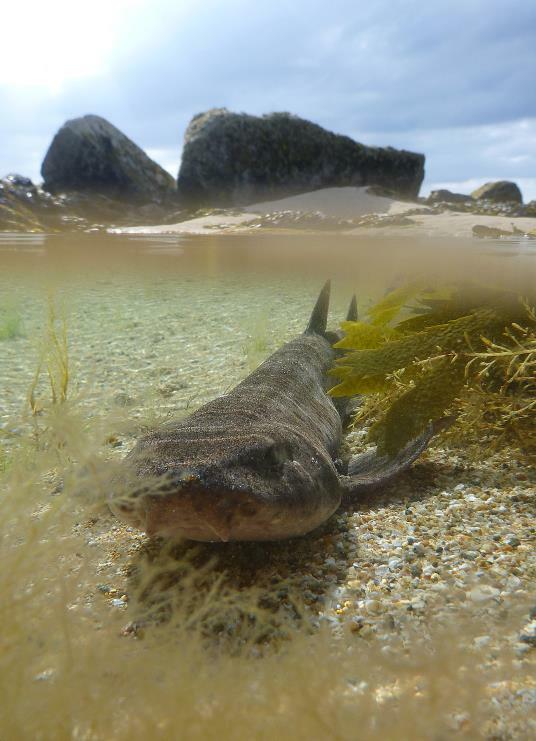 The adoption of an on-line recording system, hosted by Jersey Biodiversity Centre will help improve collection of these data, improve consistency of reporting and allow for more revealing future analyses of e.g. population trends. 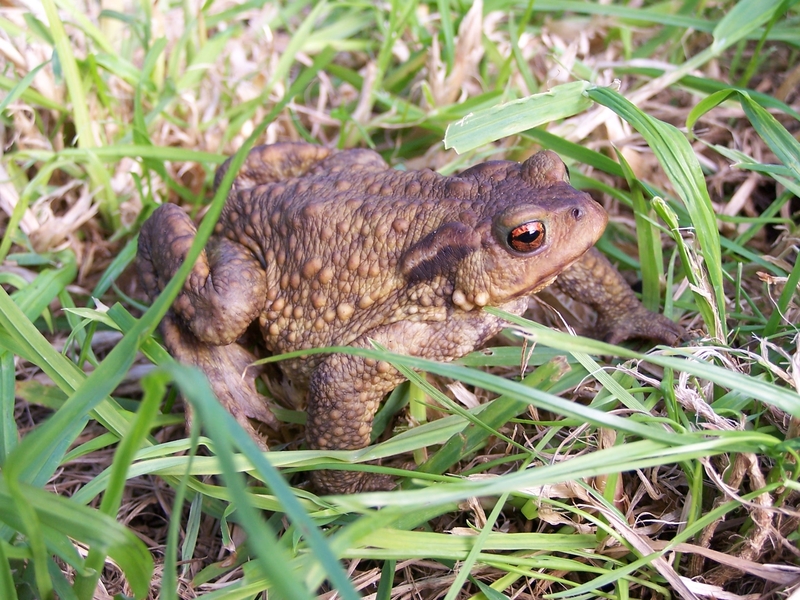 Update the available information on creating toad habitat/ponds. 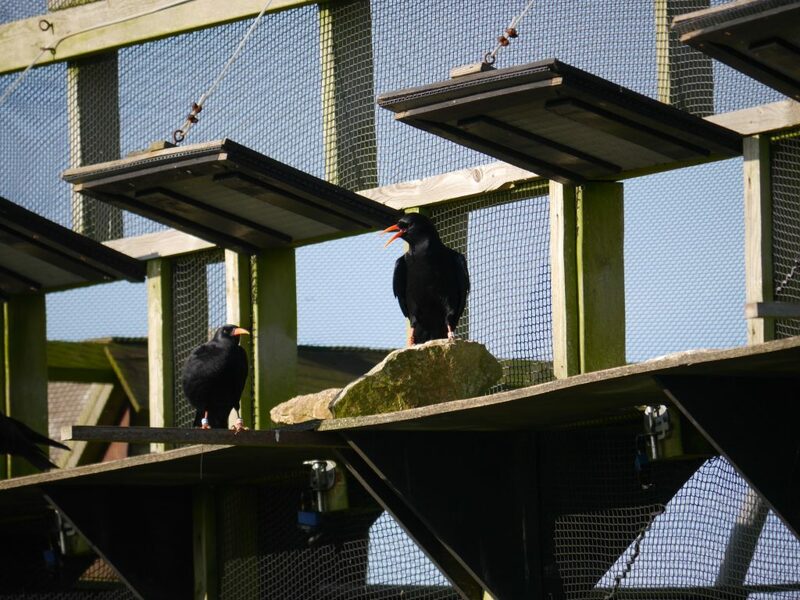 On 3rd October the choughs inside the release aviary were given access outside to join the free-living flock. Chick S is still missing presumed dead so the radio-tracking study will focus on the eleven remaining captive-bred juveniles of 2016. 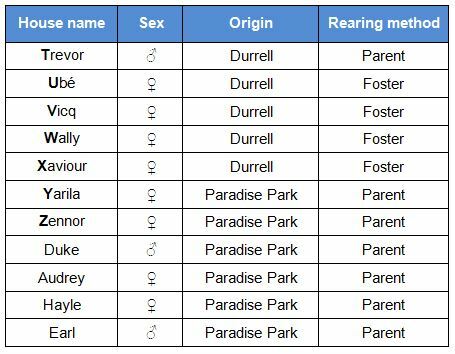 This includes Trevor, Durrell’s parent-reared male, already at liberty with the older birds. However, our primary concern during the first week of the October release was ‘simply’ making sure the six Paradise Park birds survived. Table 1: The identities of the radio-tracked choughs for the 2016 release. The four foster chicks knew what to expect due to their summer outing shortly after fledging. The six birds from Paradise Park had to take a leap of faith. For a few it was obvious that the situation was overwhelming. The physical stress of flying outside of the aviary parameters started to show quite quickly. Earl took to the air after a period of contemplation on the outer shelf. His flight was quite laboured compared to the birds with several months flying experience. He flew continuously making several loops high above the aviary and started flying open-mouthed implying shortness of breath. When he finally landed back at the aviary it took him several minutes to compose himself, standing on the shelf, mouth wide open, before venturing back inside to feed. One of the females, Yarila, acted in a similar fashion. 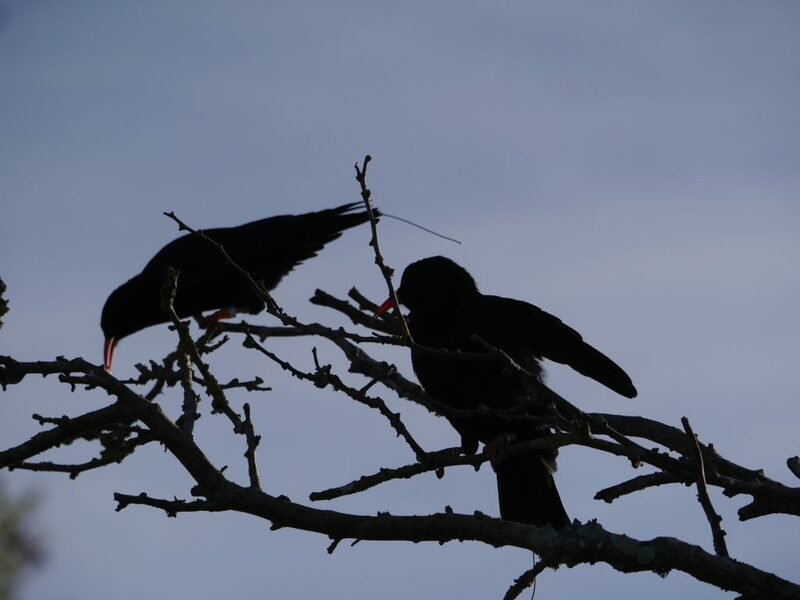 She flew non-stop for almost an hour flapping back and forth between Sorel Farm and Mourier Valley whilst the other 34 choughs paid her no attention. Almost certainly peregrine fodder, fortunately for her they were occupied elsewhere. Yarila is the name of a Russian deity symbolising spring (and an anagram of Ali and Ray). Fingers crossed she makes it through to the spring if she keeps up antics like that. Earl (on the rock) returned to the aviary after his first flight looking visibly stressed. After taking several minutes to compose himself he went back inside to feed. Photo by Liz Corry. The foster chicks also appeared to have had a hectic first half hour. Hopefully more out of excitement than stress. Very quickly they settled back into life outside the aviary, foraging together or joining the adults in flight around Sorel. They chose to roost back at the aviary which helped calm the nerves of the tracking team. Two of the foster chicks, Wally and Ube, quickly settled back into their old ways having already experienced life outside the aviary for two months back in summer. Photo by Liz Corry. 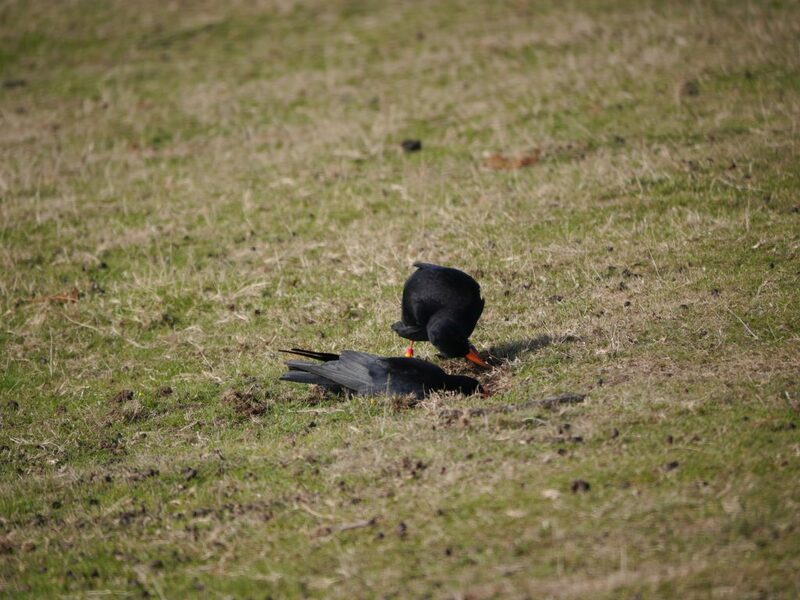 Trevor (red over orange leg ring) foraging alongside one of the older birds. Photo by Liz Corry. Dingle, seen here preening his partner Red, demonstrating just how interested the older choughs were in the new additions to the flock. Photo by Liz Corry. Duke and Earl are two males from Paradise Park and very important for the future of the wild population. No surprises then that these two deviated from the plan. After recuperating in the aviary, Earl took flight again following a group leaving the aviary towards the quarry. Radio signals suggested he was with the group flying around the quarry which put the tracking team at ease and allowed the focus to shift to Duke who had wandered off to the cliffs. Student Simon ready and waiting with the tracking gear in case the released choughs disappear out of sight. Photo by Liz Corry. The radio signal for Duke suggested he was part of a trio hanging around the top of Sorel Point. As the team crept closer with binoculars primed, the choughs took flight and dropped behind the point. 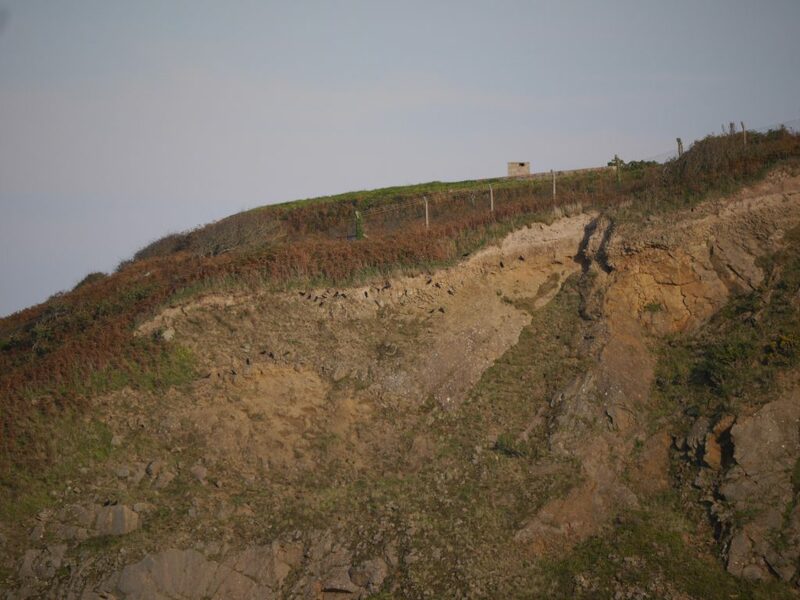 Half an hour before sunset Duke reappeared, alone, on the cliff-top near the aviary. We know from previous releases, that if the bird is not at the aviary as the sun is setting on their first night out they start to panic. They look for an alternative roost site within their immediate vicinity which might not be appropriate, but it is the only option they see. 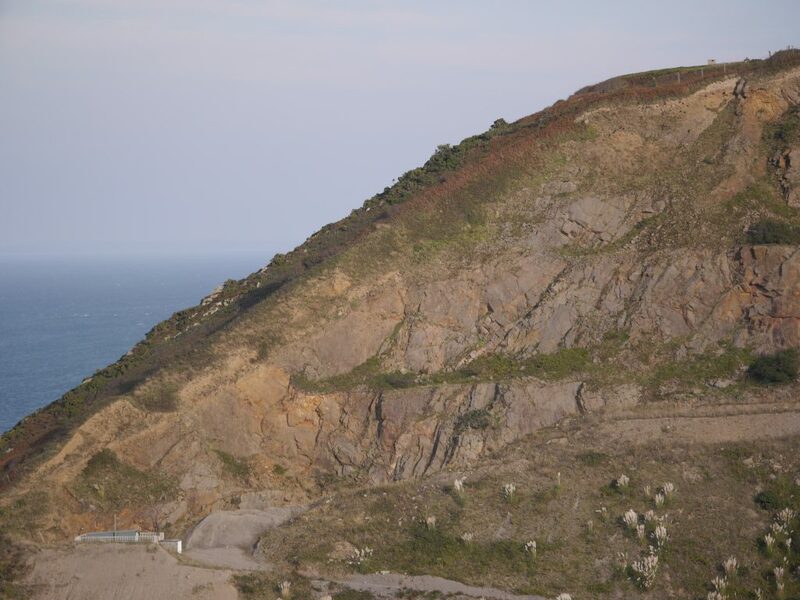 Duke had settled in an area where we have a nest box secured on the cliff face. When his signal disappeared at sunset we had to hope he had found the box and was sheltering at the back. Sunrise from Le Marionneux. Photo by Liz Corry. Returning at sunrise we found that Duke‘s signal was coming from the same area. We tried to scour the area as best as possible, bearing in mind sections of shear cliff and thick vegetation physically blocking areas and the cliff structure bouncing/blocking radio waves. We started to fear the worse after two hours of the signal behaving as if the bird (or transmitter) was stationary. Suddenly a chough flew up out of nowhere, called, then disappeared. Was this Duke or one of the others who had been foraging nearby? At 10:30 the student went off to prepare the dishes for the morning feed at the aviary. Much to everyone’s surprise Duke was at the aviary flanked by the other Paradise Park chicks. He didn’t seem quite at ease, but must have been as relieved to be back as were we. At the same time as searching for Duke we had to find out what had happened to Earl. His signal was still at the quarry despite all the other quarry roosting choughs dispersing at dawn. 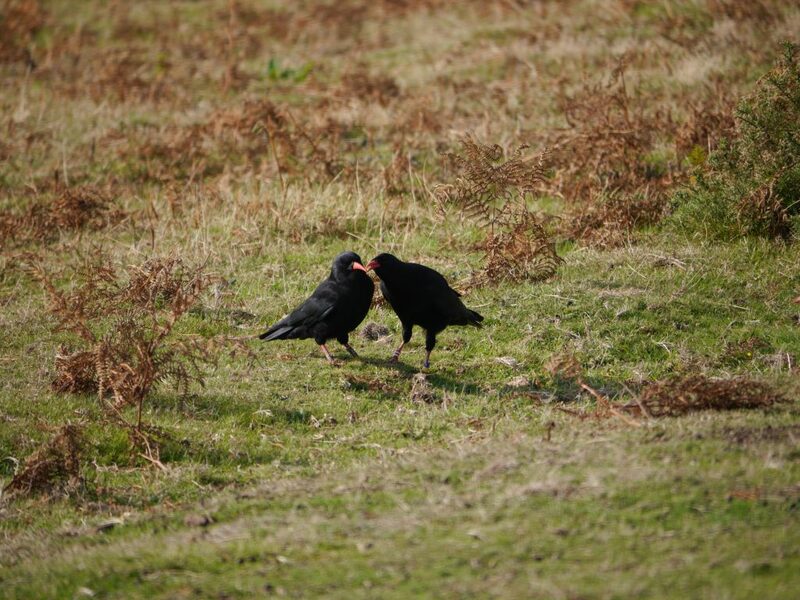 Trevor and sixteen other choughs had entirely vanished. No sign of them at Devils Hole or Crabbé. The three breeding pairs and their chicks were foraging with the newbies at Sorel. Earl was alone. As with Duke his signal was not changing location but it was behaving as if he was moving. Possibly short flights back and forth. Yet not a single chough in sight. The good news was that he had gone to the side of the quarry where others have in the past and we can get supplemental food to them (via a catapult). The bad news was that it was also the same place where Ronez perished last year. 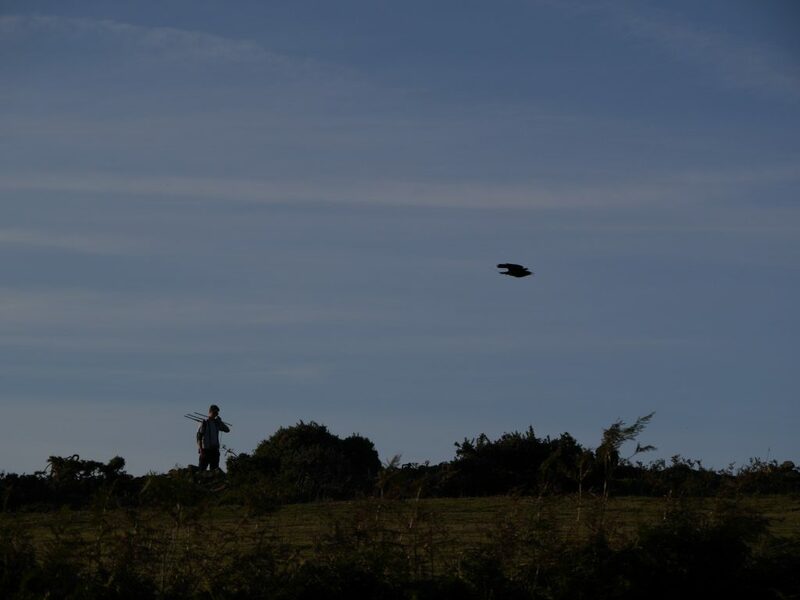 As the sun was setting 24 hours after Earl had first arrived at the quarry, a large group of choughs flew into the quarry. They started foraging for food in the same area where Earl‘s signal was coming from. A total of 27 choughs were there including the foster chicks. He had to be in that group. Surely this meant he would roost with either the quarry group or follow the foster chicks when they headed back to the aviary to roost. Earl spent his first day outside of the aviary alone on the east side of the quarry. Photo by Liz Corry. A group of twenty-seven choughs including Earl foraging in the quarry shortly before roost. Photo by Liz Corry. Nope. Day 2 began like groundhog day. Earl alone in the quarry, Trevor and a large group off travelling the Island, and the remainder at the aviary. The major difference was at 9am when suddenly Earl appeared, sat on a rock. Jumping into action, chough food was catapulted over the fence towards Earl. Initially he seemed oblivious, then noticed the food and started eating. Earl made an appearance after a day of hiding in the quarry. Photo by Liz Corry. Staff managed to catapult in food for Earl to boost his energy levels. Photo by Liz Corry. We paid him another two visits making sure he kept his energy levels up throughout the day. 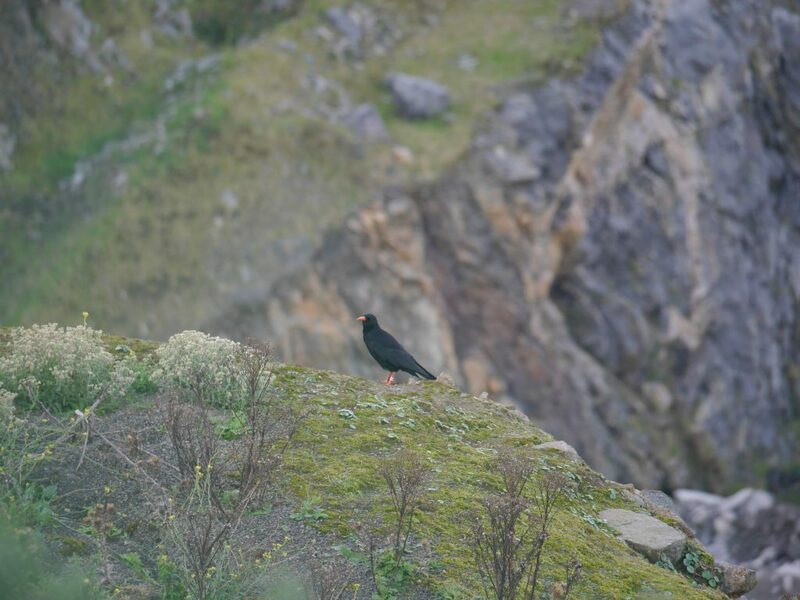 Then at 3pm a group of 19 choughs flew in from the direction of the quarry and landed at the aviary. One of which was Earl. Unfamiliar with the concept of walking on netting he edged his way slowly across the roof to re-join the Paradise Park chicks. Earl cautiously walking across the netting for the first time to get back into the safety of the aviary. Photo by Liz Corry. The rest of the first week outside was relatively uneventful. The newbies stayed around Sorel along with the breeding pairs with occasional visits to the quarry or Devil’s Hole. 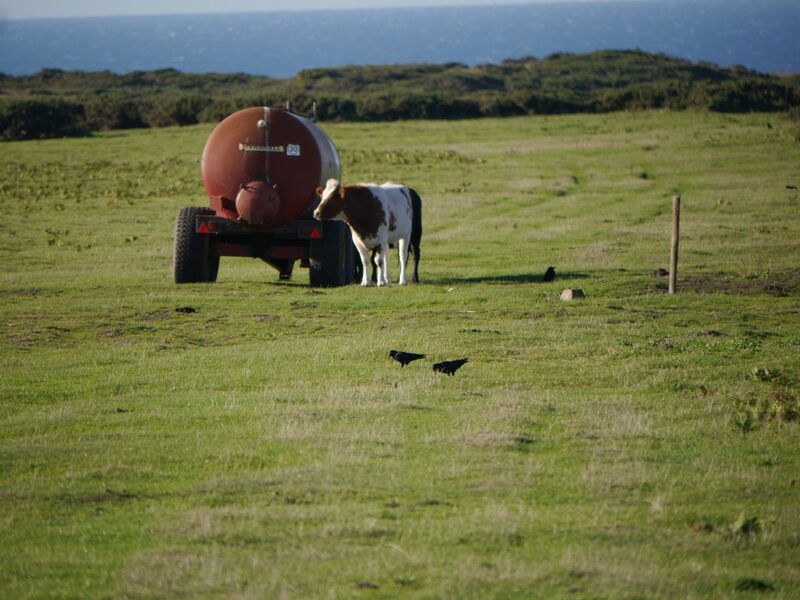 It was Trevor and other choughs who caused fun and games for the tracking team. We knew the older birds had been visiting other areas along the north coast thanks to a couple of public sightings. Once we started radio-tracking again from dawn until dusk it was evident the visits were common place. Even before the sun had risen over the horizon a group had set off to find breakfast at Les Landes. They visited the race course at Les Landes last autumn. This time round there are more of them and the consistency of their visits is fairly promising. They are expanding their range and who can blame them with managed grassland potentially rich in invertebrates thanks to the dung produced from the resident cows in the middle of the track and the visiting horses. Sunrise at Les Landes where the choughs were having breakfast. Photo by Liz Corry. Choughs foraging in the middle of the race track which just happens to double up as cattle pasture. Photo by Liz Corry. 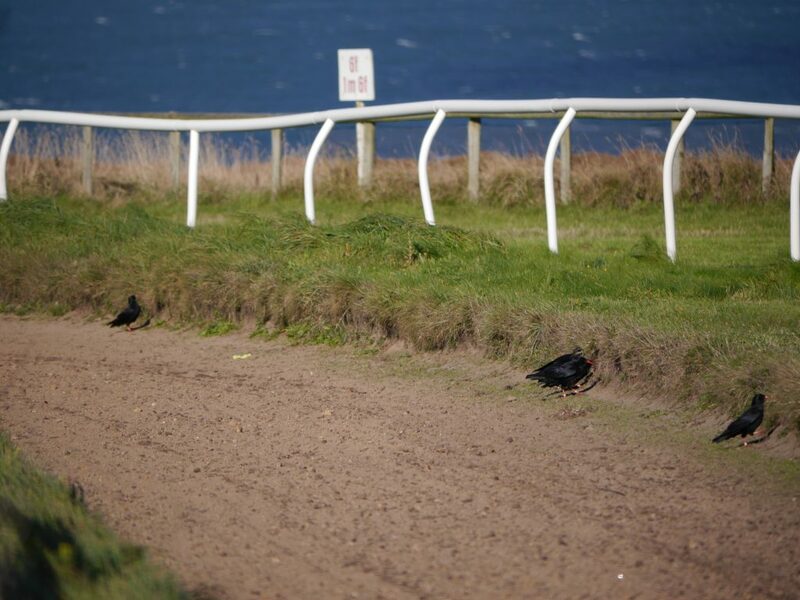 The track at Les Landes proving popular with the choughs out of the horse racing season. Photo by Liz Corry. It is a difficult area to keep track of exactly how many choughs are present. It may look flat, but there are plenty of dips, dents, and barriers to visibility. The most challenging being when they land in amongst the heather as you can see below. Can you spot the TWO choughs in amongst the heather at Les Landes. Photo by Liz Corry. 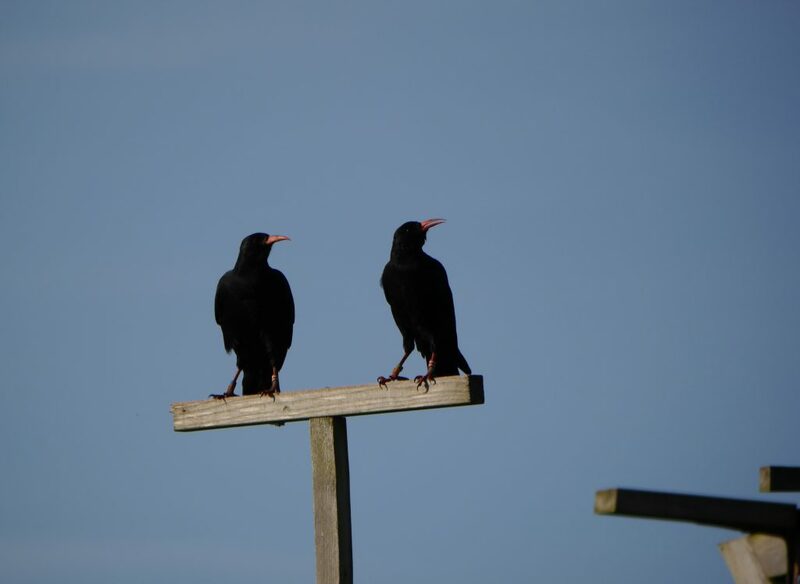 Other areas regularly visited by the choughs this month have been Crabbé shooting range, L’Etacq just south of the race course and the Model Aircraft Field. 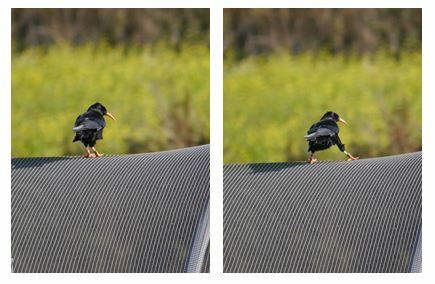 There is a prize up for grabs to the first person to get a photo of a chough taking off from that runway! They have also been seen flying over Plémont to get to or from Les Landes. 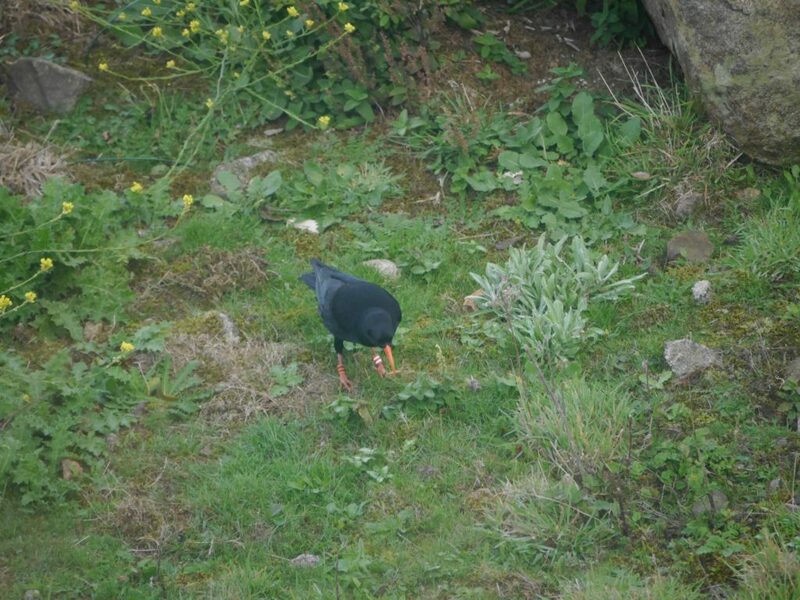 No one has yet reported seeing a chough feeding at Plémont. The habitat restoration work carried out at Plémont by the National Trust for Jersey should make it more attractive to the choughs over the next few years. If not sooner. 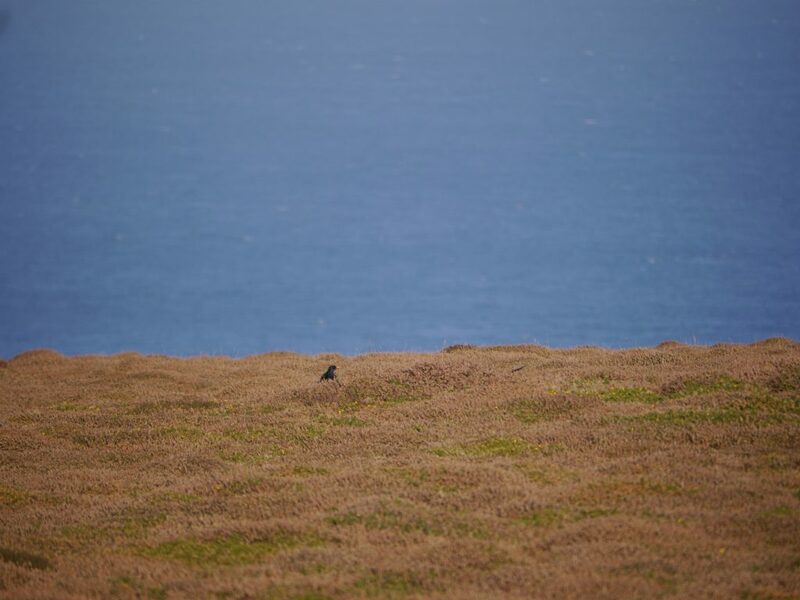 We are starting to collect a few intriguing sightings in areas where we wouldn’t typically expect to see the choughs, but not impossible considering the size of the Island. They tend to be a single bird flying overhead, making it impossible to identify the individual. It also means we cannot be certain if they are using that area or just flying over en route to another location. Either way we are urging Islanders to keep an eye out in St Lawrence and Trinity! Of course it doesn’t help matters when the birds you are tracking drop their radio-transmitters. After only two weeks Zennor lost her radio-transmitter. It dropped close to the aviary with the feather still attached. The quill was damaged. This could be an indication of why the feather came out before their natural moult. Equally the damage could have occurred after it dropped by feet (or hooves!) unknowingly trampling the feather. Zennor tends to stay close to the other juveniles which means her movements should be relatively easy to follow. Hopefully this is a one off and the others stay attached until the birds moult naturally in May/June. We finally succeeded in trapping the sick wild chick, PP003, in the aviary towards the end of the month. Her condition had not worsened, but it certainly wasn’t improving. After an injection of wormer and visual inspection by Durrell’s vet nurse she was released and re-joined the group. We have noticed a considerable improvement and will continue to monitor in case a second dose of wormer is required. The end of British Summertime saw a shift in daylight hours and has meant that the supplemental feed in the afternoon has been brought forward to 15:00 from 30th October. Our roost checks will now occur daily at a more amenable time as sunset becomes earlier and earlier. With the choughs successfully released and settling down into their new lives in the wild it was time for a day off. 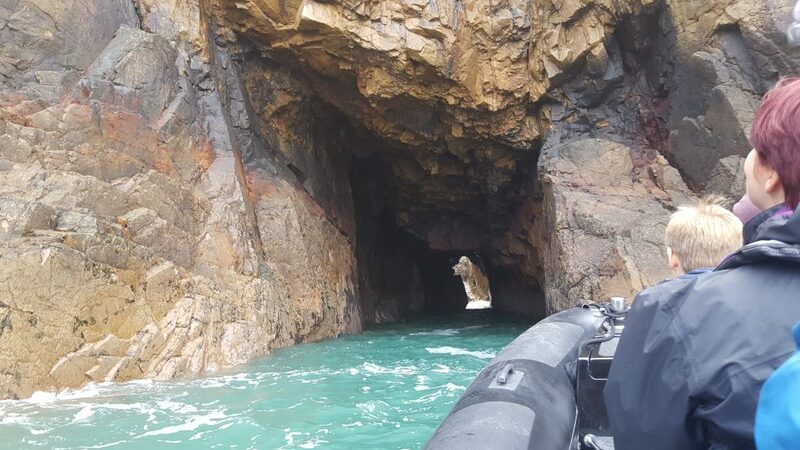 What better way of relaxing than taking a boat trip with Jersey Seafaris to see….the choughs. To be fair, the two hour trip along the north coast from St Catherine’s Breakwater to L’Île Agois promised sea caves and dolphins and nothing (strictly) to do with choughs. That being said it did provide a unique opportunity to scour the coastline thinking about future breeding sites when competition in the quarry forces new pairs to look elsewhere. There are plenty of caves and crevices along the north coast, but many are cut off at high tide. Devil’s Hole has always looked appealing and resembles may of the Cornish breeding sites. 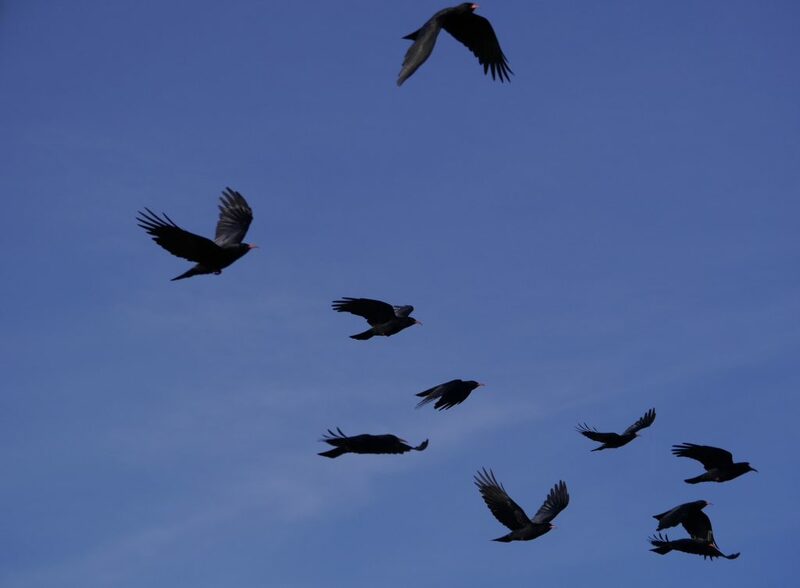 On this particular day the choughs were flying high above Sorel Point, but they frequently visit Devils Hole. The boat trip does not go as far round as Les Landes and Plémont. Even if it did, we would have run out of time that day. 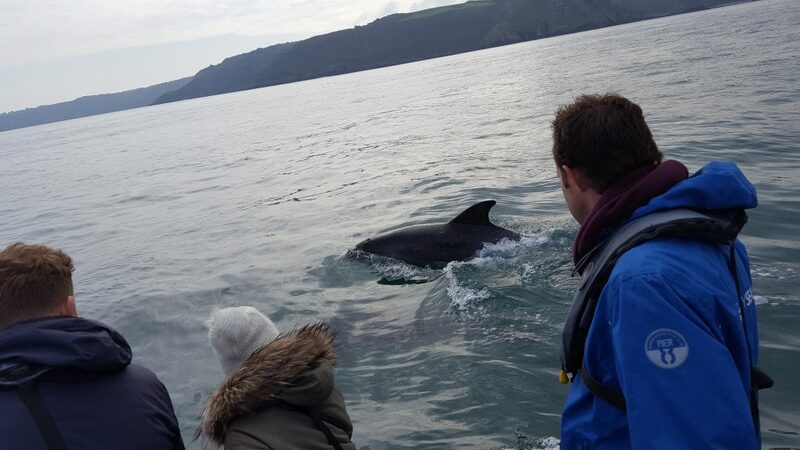 A pod of dolphins complete with baby, kept crew and passengers engaged a lot longer than anyone anticipated both there and back. 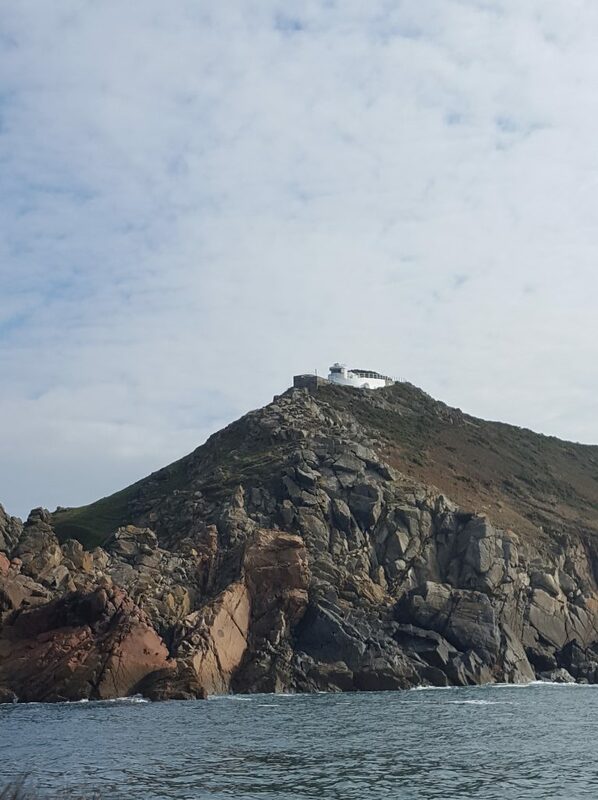 Sorel Point as viewed from the sea. Photo by Liz Corry. The entrance to the blow hole at Devil’s Hole can only be accessed by kayak at low tide (and calm seas). Photo by Liz Corry. Dolphins are a fairly common sight along the north coast of Jersey. Photo by Liz Corry. 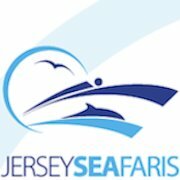 It is well worth hopping on board a Jersey Seafaris excursion and seeing the Island from a completely different perspective. It becomes clear, very quickly, why it is important to protect Jersey’s natural heritage on both land and sea. Below is a video of the trip filmed by Mark Errington. You won’t be able to ‘play spot the choughs’, but there is a split second cameo by yours truly. Durrell and the National Trust were proud to host Maggie Walker from the Audubon Society and her sister Jane Kramer on 5th and 6th October. 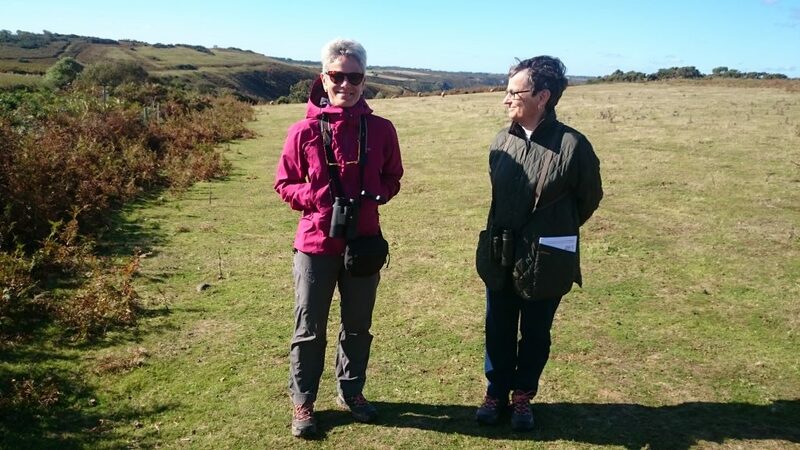 Maggie and Jane visited Durrell’s Wildlife Park and the choughs before getting a guided tour of the National Trust conservation fields and other areas of their work. On 15th November the Guernsey’s States of Deliberation will debate a new Policy and Resource Plan. This new policy document outlines the values and vision of the island and will be used to decide what the States of Guernsey will prioritise in the future. It replaces the existing States Strategic Plan, which was built around three equal pillars; Social, Economic and Environmental. The Environmental Policy recognised that our environment is unique and central to our way of life, an equal partner to our economic growth, essential to our health and social wellbeing, a fragile resource and demanding of sustainable and wise use. The new Policy and Resource Plan – “Future Guernsey” – sets out where the island should be in 20 years’ time. Unfortunately this doesn’t include protection of the environment. 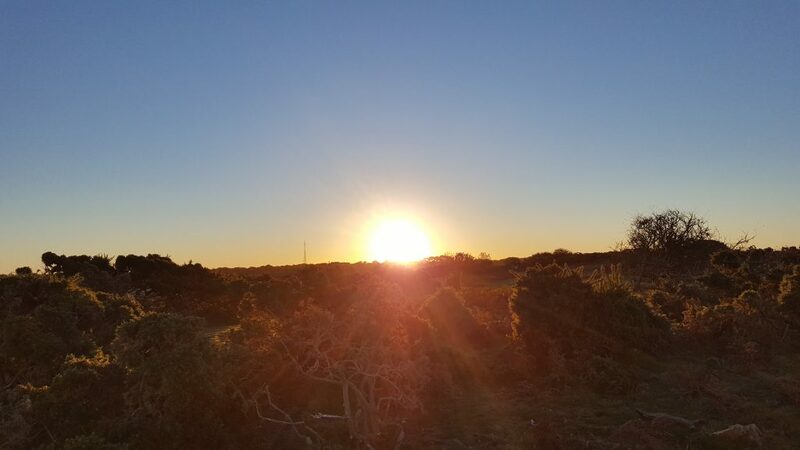 If the new plan is accepted without amendment Guernsey’s environment and countryside will be threatened by continued exploitation and development. Deputy Barry Brehaut, President of the Committee for the Environment and Infrastructure, has put forward several amendments to embed the environment in Future Guernsey. The amendments cover topics from protecting the marine environment to fostering engagement from the community in nature conservation. A group of local organisations who are passionate about Guernsey’s natural environment and way of life have joined together to campaign for the States of Guernsey to vote in favour of these amendments. 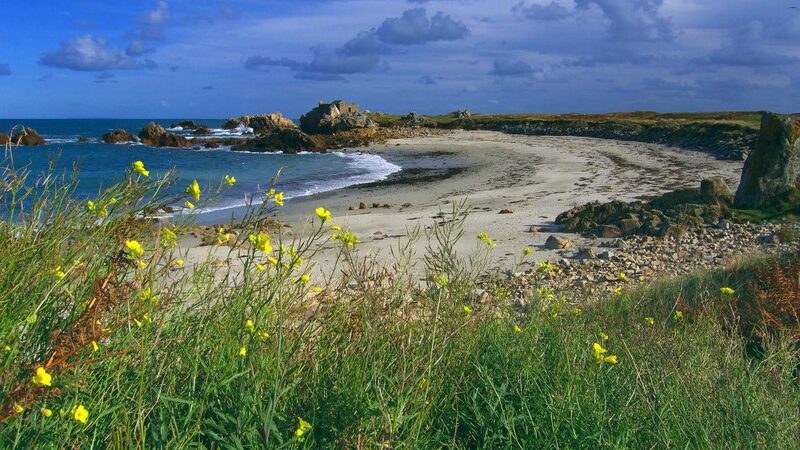 They believe that the in 20 year’s time Guernsey’s environment must be at least as good as it is now. The island cannot afford the loss of more green space or wildlife. Guernsey has already lost over 80 species in the last 100 years and we should not accept the loss of any more. The campaign, “Standing up for Guernsey’s Environment” is calling for the public to contact their deputies and appeal them to support Deputy Brehaut’s amendments and ensure the States consider the environment in their new strategic policy. Standing Up For Guernsey’s Environment is a collective of representatives from La Société Guernesiaise, RSPB Guernsey, The National Trust of Guernsey, Guernsey Tree’s for Life, Guernsey Climate Action Network, Guernsey Conservation Volunteers and La Société Conservation Herd. They are passionate about Guernsey’s natural environment and promoting environmental consideration within States decision making. A new paper in Science by Franz Bairlein highlights how habitat degradation and loss, illegal killings, and climate change threaten European migratory bird populations. 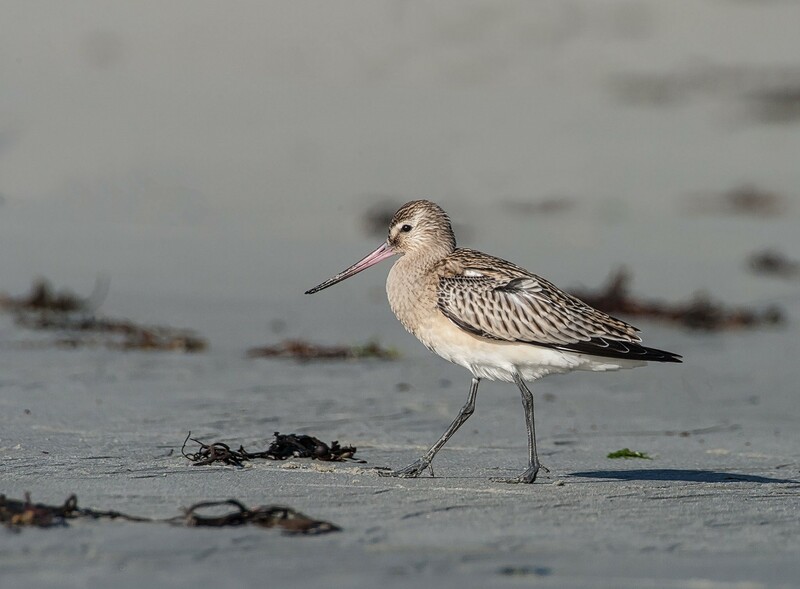 The populations of migratory bird species that breed in Europe and overwinter in sub-Saharan Africa are declining considerably faster than those of nonmigratory resident species or of migratory species that overwinter in Europe. Likely factors are habitat changes due to changes in land use, illegal killing and taking along the northern African coasts, and climate-induced changes in timing of migration and breeding. However, not only European trans-Saharan migrants are declining fast. This holds also for North American long-distance migrants wintering in Central and South America. To halt these declines, preservation of remaining habitats and restoration of habitats both at breeding and no-breeding grounds is essential, as well as stopping illegal killing and taking of birds along their migration routes. Every year, between 11 million and 36 million birds are killed or taken illegally in the Mediterranean region. The areas of greatest concern are in the eastern and central Mediterranean, with more than five million birds taken in both Egypt and Italy and an estimated one million each in Cyprus and Lebanon. 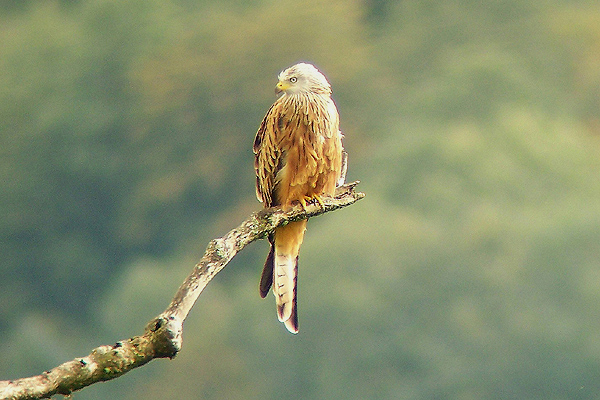 Common migratory species such as Eurasian chaffinch, blackcap, and song thrush are most affected, but many less common migratory species are also taken in substantial numbers, including species of global conservation concern such as red kite and Eurasian curlew. On average, the annual illegal killings and takings of threatened or near-threatened migratory bird species amount to 1-3.5% of their populations – percentages that are very likely to have considerable impacts on the fate of these species. Illegal trapping can cause a collapse in population numbers within a short period of time. For example, the yellow-breasted bunting was abundant in its Eurasian breeding range until illegal takings in China caused an 84% population decline between 1980 and 2013. Many European migratory birds that overwinter in sub-Saharan Africa do not travel across those areas of the eastern Mediterranean most affected by illegal killings. Rather, they use a flyway across the western Mediterranean where illegal taking is much less intense. Other factors must play a role in their decline. A large number of European migratory species overwinter in the dry savannas of sub-Saharan Africa. Annual survival of many of these species correlates with rainfall in the Sahel zone. However, despite an increase in rainfall in the Sahel in recent decades, bird populations have continued to decline. Thus, factors other than rainfall must contribute to the population declines. Land-use and landcover changes are the most important. Between 1975 and 2000, agriculture increased by 57% in sub-Saharan Africa at the expense of natural vegetation, with nearly five million hectares of forest and non-forest vegetation lost per year. Most affected are the Sahel and Guinea Savanna zones where the majority of the Eurasian migratory species overwinter. 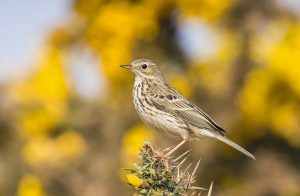 An analysis of breeding-bird survey trends of 26 long-distance migratory species in the United Kingdom shows that wintering habitat is the most important determinant of population trends, with specialist species that occupy either open or woodland habitats in Africa showing declines. Climate change is another major driver for biodiversity changes, including responses of bird populations. Many migratory species, including those that overwinter in sub-Saharan Africa, now arrive earlier at their spring breeding grounds. However, different organisms do not respond to climate change at the same pace, which has led to an ecological mismatch between some consumers and their prey. 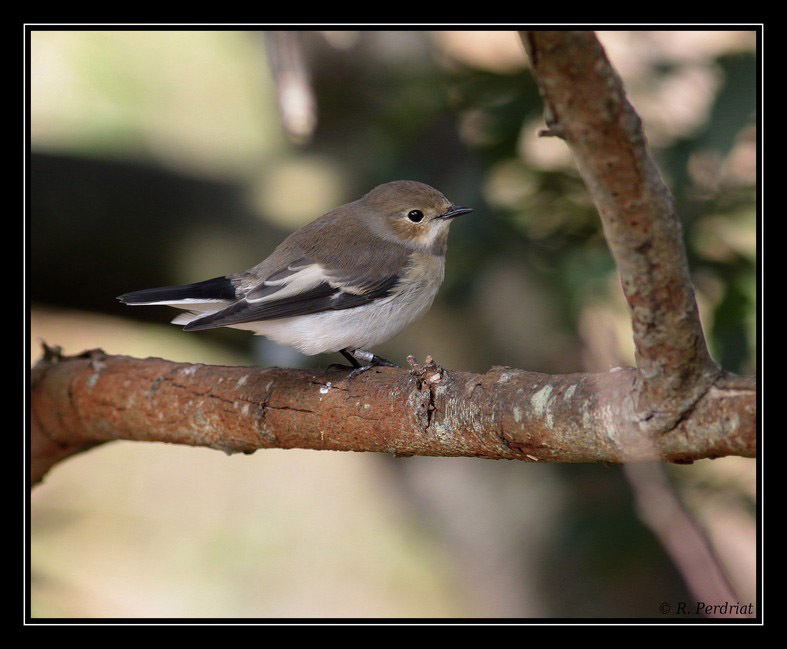 Dutch pied flycatchers, which overwinter in sub-Saharan Africa, do not arrive earlier at breeding grounds, but the populations of their insect food peak earlier as a result of warmer spring temperatures. This mismatch between breeding and food availability has caused a decline of up to 90% in Dutch pied flycatcher population sizes. Climate change–induced changes in migratory bird populations are evident in other species too, but their relative contribution to population changes in long-distance migrants wintering requires further clarification. In North America, the Breeding Bird Survey shows that half of the migratory bird species are declining; declines in long-distance Neotropical migrants are more pronounced than those of birds that migrate short distances. As for the European–African migrants, climate mismatch is a factor, but the long-distance migrants are particularly sensitive to habitat changes. Similar patterns might be expected for migratory birds in East Asia, but large-scale and long-term breeding bird population surveys, population trends, and nonbreeding habitat assessments are largely missing for that region. Any attempt to understand and ameliorate migratory bird losses must consider threats far away from their breeding sites. These threats could include killing and taking, human disturbance at staging sites, pesticide exposure, or collisions with human obstacles such as wind turbines and traffic. The most important drivers of population declines in migratory bird species are likely to be land-use changes and connected habitat degradation and loss, but few studies have investigated the specific impacts of land-use and land-cover changes on migratory bird populations in detail. Such studies are urgently needed to disentangle the various factors acting on populations of migratory species. These studies must include carry-over effects, because conditions at nonbreeding grounds can affect reproductive success in the breeding season. Conversely, conditions at breeding grounds can affect nonbreeding fitness. 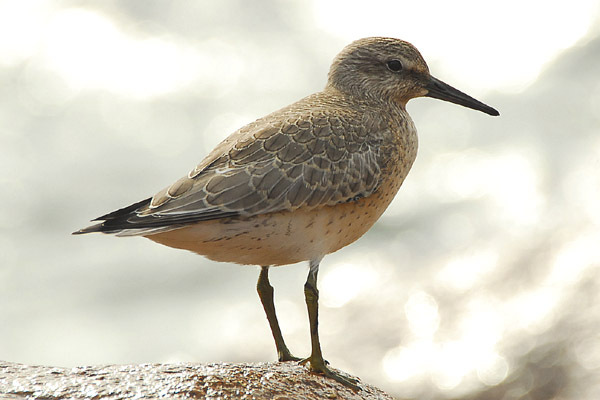 In the red knot, climate-induced malnutrition at their Arctic breeding grounds resulted in shorter bills and reduced survival rates at their African wintering grounds. Future studies must also consider the role of stopover sites. Most long-distance migratory species rely on considerable fueling at such stopover sites before they embark on migratory flight, particularly if they need to cross oceans or deserts with no or limited feeding opportunities. 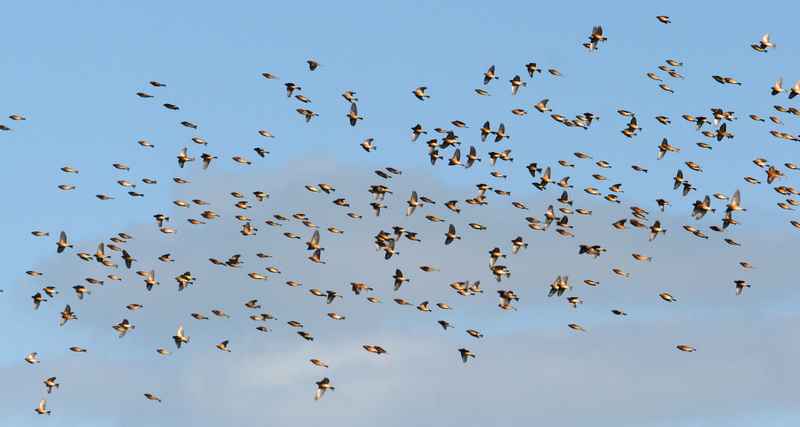 The main fuel for migratory flights is fat. Consequently, migrants must accumulate enormous amounts of fat before migratory flights, some doubling their body mass within just a few weeks. To achieve that timed fueling, suitable habitats and food must be available at stopover sites. The effect of habitat loss and degradation at stopover sites on population trends in trans-Saharan migrants remains uninvestigated. Consequently, future studies also need to clarify where species of conservation concern stop over and overwinter, and which migration routes they take. For example, British common cuckoos migrate along two routes to the same winter destination in sub-Saharan Africa. They face a much higher en route mortality when migrating along a western route than along an easterly route. Emerging technologies for tracking individual migratory birds throughout their annual cycle will reveal migratory routes and destinations in more detail than past bird marking, allowing more detailed and frequent assessment of the drivers of migratory species declines. Existing data can, however, already be translated into immediate conservation actions to halt the decline of these migratory species. Wetlands can be protected from drainage; woody vegetation can be protected from grazing or even be replanted. Such efforts would not only support migratory birds but also the local biodiversity and livelihoods of local farmers and pastoralists. In addition, illegal taking and killing can be stopped. The required political instruments, such as the African–Eurasian Waterbird Agreement and the African–Eurasian Migratory Landbird Action Plan, are already in place. We just need to act, and we can if we wish. Please join us on the north coast on Sunday 6th November to help undertake young hedgerow management. Please note: This task takes place a week earlier than normal to avoid clashing with Remembrance Sunday. Agricultural fields at Le Don Hodges on the north coast (immediately inland from the chough aviary) were acquired by the National Trust for Jersey in 2012. Since then, thousands of bare root whips of native hedgerow tree species have been planted as part of a programme of hedgerow restoration. This forms part of a wider wildlife farming initiative being implemented at the site that also includes the planting of conservation cover crops for birds and pollinating insects through BOTE. In order to give the young hedgerow trees the best start possible we now need to undertake some management. 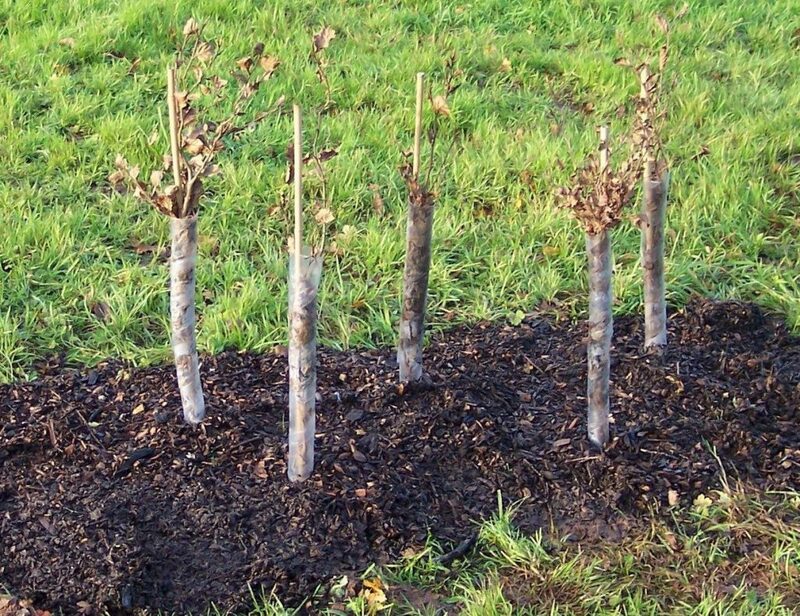 This month’s task will involve clearing the vegetation and mulching around the base of the trees, cutting back encroaching bramble, replacing broken/missing tree guards and canes, pruning the trees to encourage dense growth, and planting up any gaps where the planted whips have not survived. Meet in the car park at Sorel, La Rue de Sorel, St John, west of Ronez Quarry. Meet at 10.20 for a 10.30 start. From there we will walk westward to the site. Tools needed As always, we can supply some tools, but please bring your own if you have them. Cutting tools such sickle, secateurs and/or loppers would be very useful if you have them. Clothing needed . Good thick gloves (though we can supply a pair if you don’t have them), wellies or sturdy boots, (it shouldn’t be muddy but the vegetation may well be wet it and it may be rough underfoot) and common sense clothes to cope with the elements, we go ahead whatever the weather! Work will be finished by 12.30. And, some would say most importantly, Kim the Kake will supply us with hot drinks and her yummy homemade cakes. 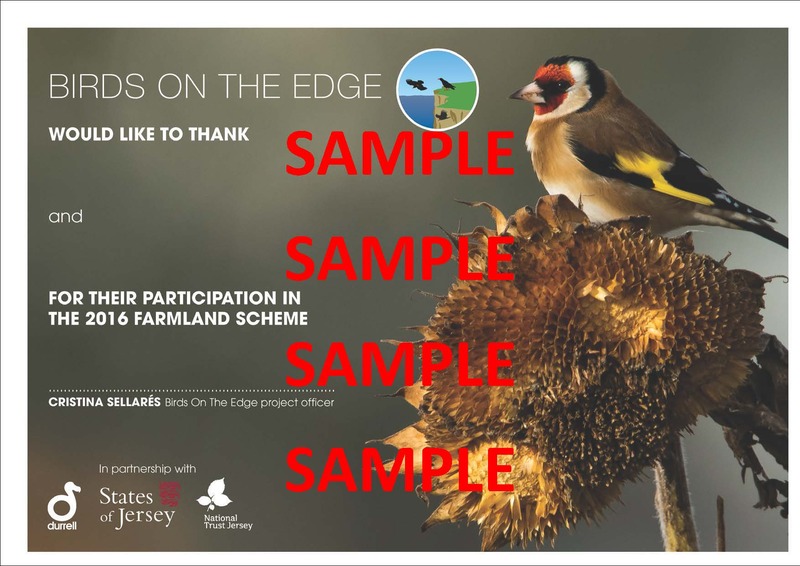 Earlier this year Birds On the Edge were invited to several very important public events in Jersey including the launch of the Jersey National Park. As a project of multiple partners it was rather unfortunate that we did not have any publicity material or displays of our own that we could use in our own right to help reach out to the very people who would most appreciate learning about the project. We sought, however, to change that and with the kind assistance of Christine Holmes and Rich Howell at Durrell have started to make our presence in Jersey better felt. We are indebted too to Romano da Costa and the BOTE team for allowing us to use these beautiful photographs. 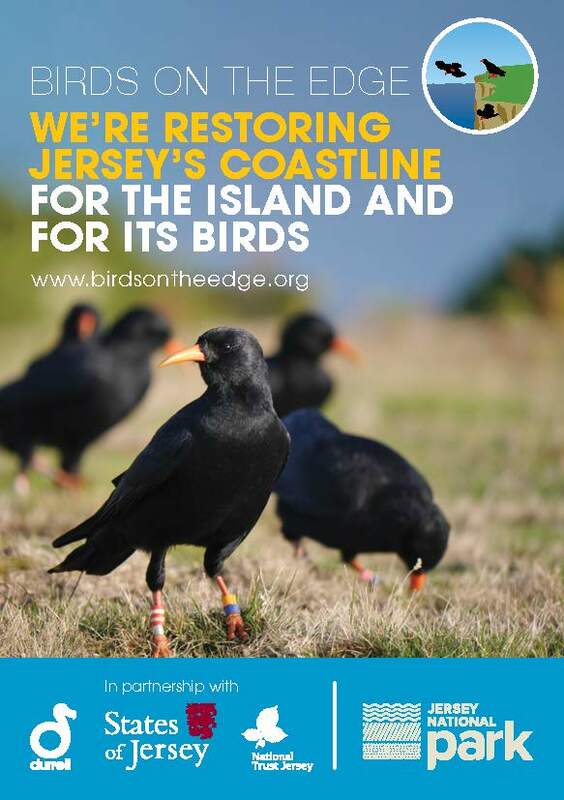 First we produced three beautiful pop-up banners displaying the three key elements of the project: the farmland scheme, conservation grazing and the return of the chough. Each of these banners, standing at over six feet tall, will brighten up any function! To accompany the banners we created a full colour A5 flyer (top of page) that we can conveniently leave where people will pick them up and show them to their friends. In fact, please feel free to download one here, print as many as you like and spread the message! Finally, and very importantly, as a thank you to our most important friends and partners – the farmers who are working hard with us to help the Island’s hard-pressed birds – we have produced a unique certificate of thanks. These beautiful documents convey our sincere appreciation to their hard work and they can be displayed on the wall as our permanent tribute for their efforts. They will also be useful during the farms’ environmental audits and on applications to funding bodies such as the Countryside Enhancement Scheme. These you can’t just download, you’ll have to join forces with us!